so the sitemap at this link is provided to allow you to navigate this site. easier navigation of this site. 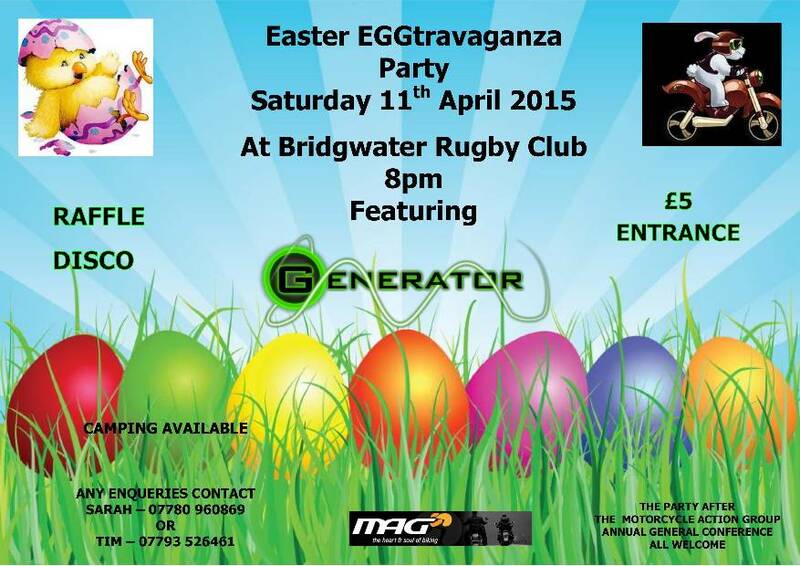 Venue: Three Crowns, Southampton Road, Whaddon, SP5 3HB. Starting at Halfords in Eastleigh, 9:30 for 10:00 start. Ends at Departure Lounge Cafe, Alton. from 09:00 for 10:00 start, running out to Nursling. See route map. North side of A303, halfway between junctions with the A34 and M3. The Prince Of Wales 98 Morden Road, London SW19 3BP. 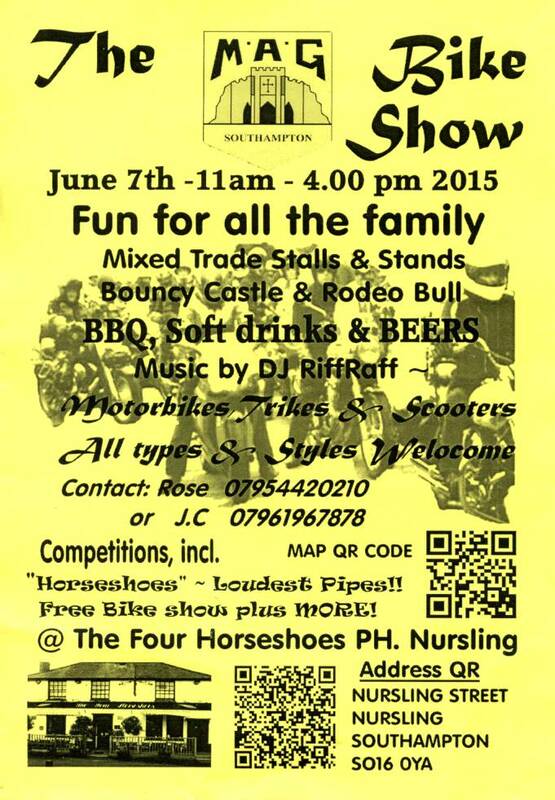 Venue: Crofton, Stubbington. £10.50 per head. 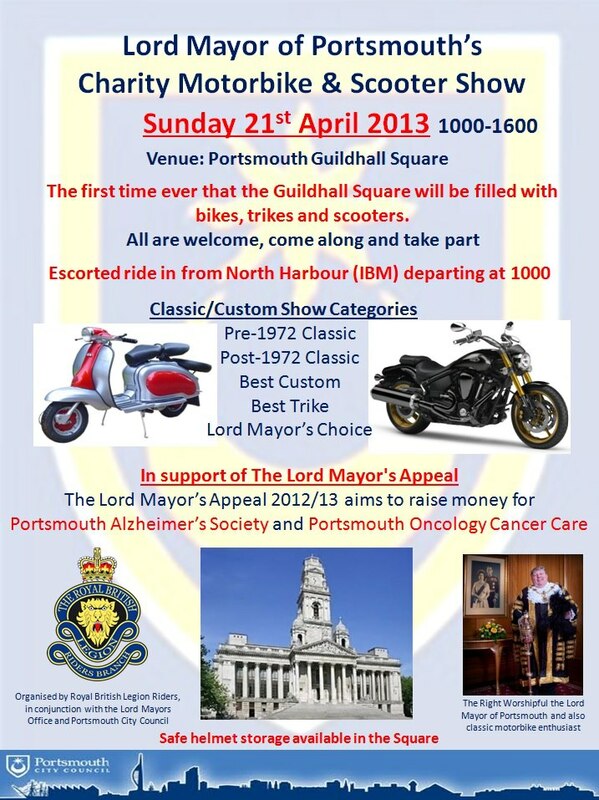 Portsmouth MAG's Annual General Meeting at 19:30 for 20:00 start. NABD's 27th You've Been Nabbed Rally. Transport Festival 2018 starts at 11:00. Venue: War Memorial Park, Basingstoke. 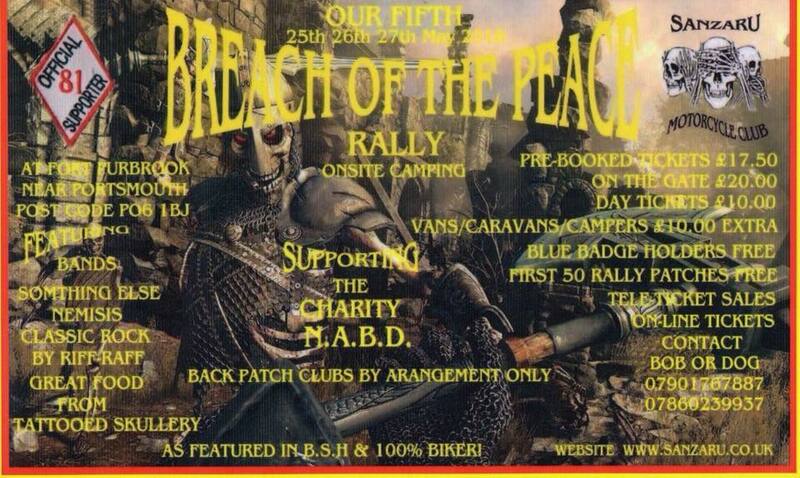 Sanzaru Motorcycle Club 5th Breach of the Peace Rally. 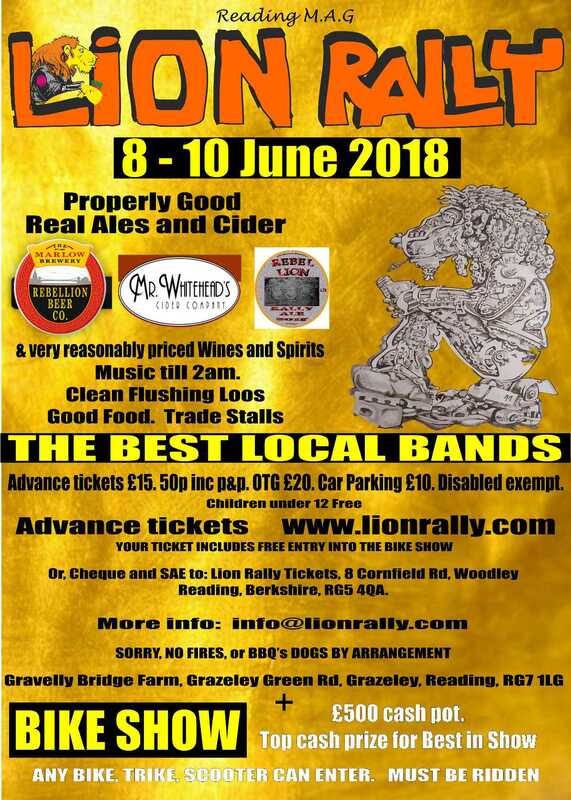 Reading MAG's 28th Lion Rally. £15.50 advance tickets, £20 on gate. 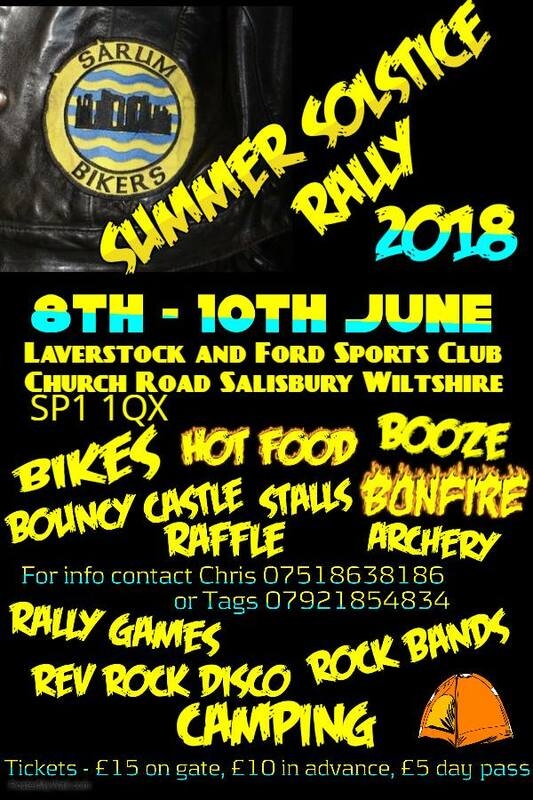 Sarum Bikers Summer Solstice Rally. MAG South-East's MAGFEST 3 Rally. Booking in starts 10:00, conference at 12:00. John is leading a run from Halfords car park in Woodside Avenue, Eastleigh. 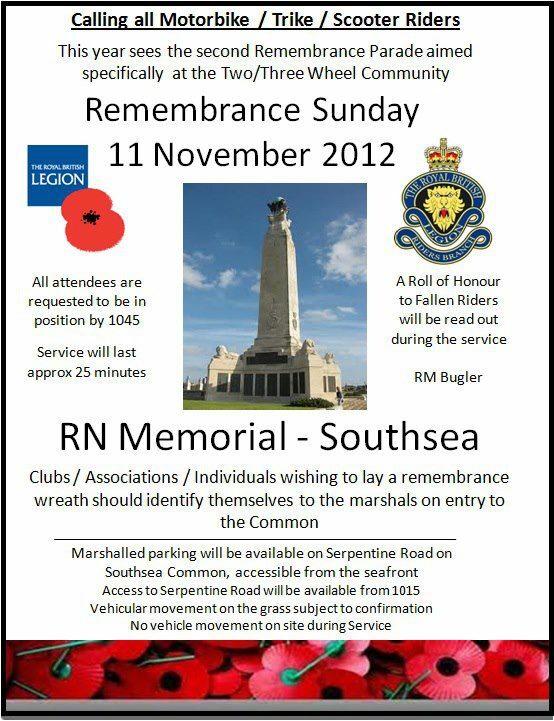 at 10:00 to go to the RN Memorial Service in Southsea. 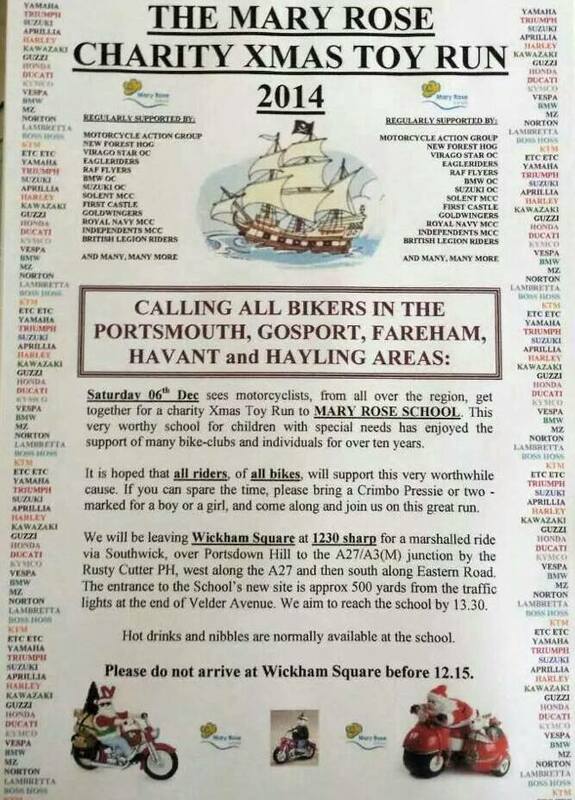 Meet at the Wickham Square from 12:15 for a 12:30 start. 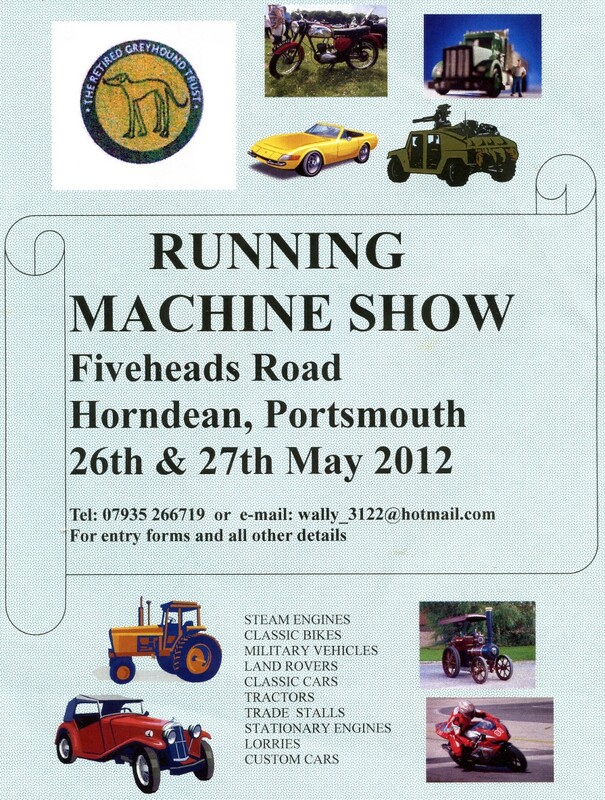 Fred Hill annual memorial run to Dorchester. 11:30 meet for a midday departure. 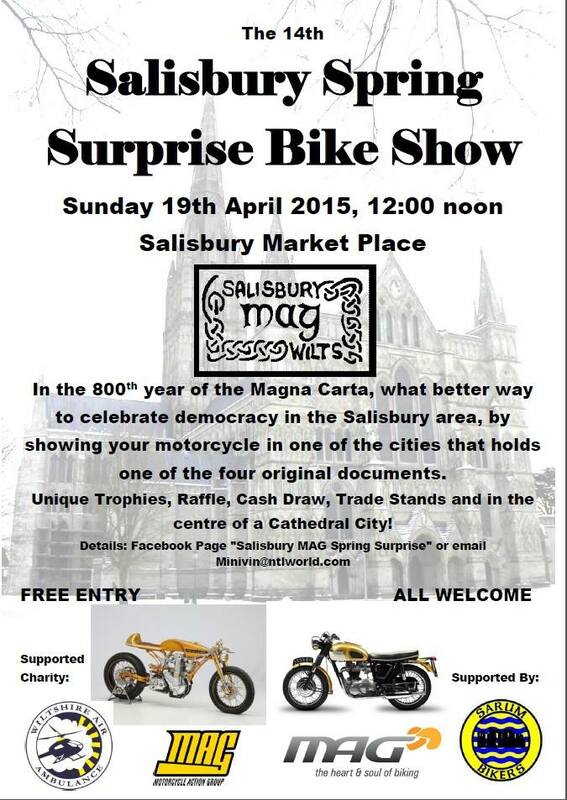 Salisbury MAG's 16th Spring bike show starts at 12:00. 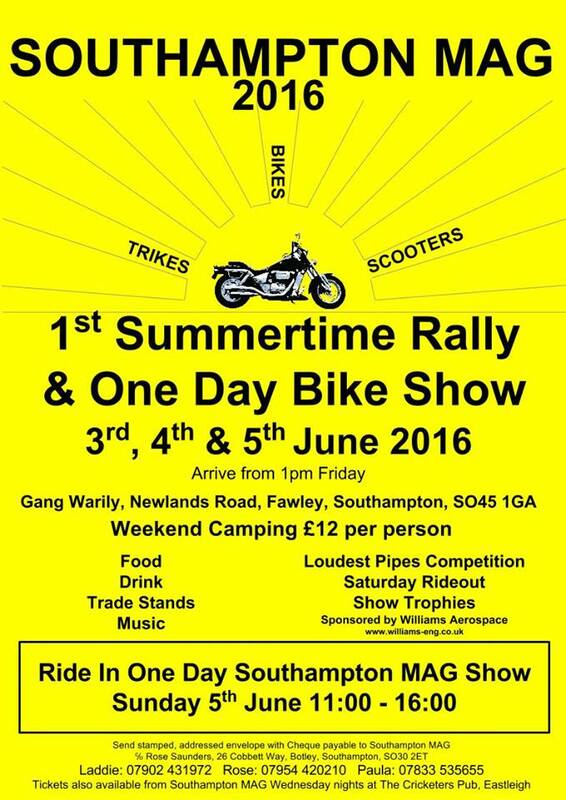 Rally and Bike Show Southampton MAG Rally & Bike show starts 2nd June, camping tickets £15. 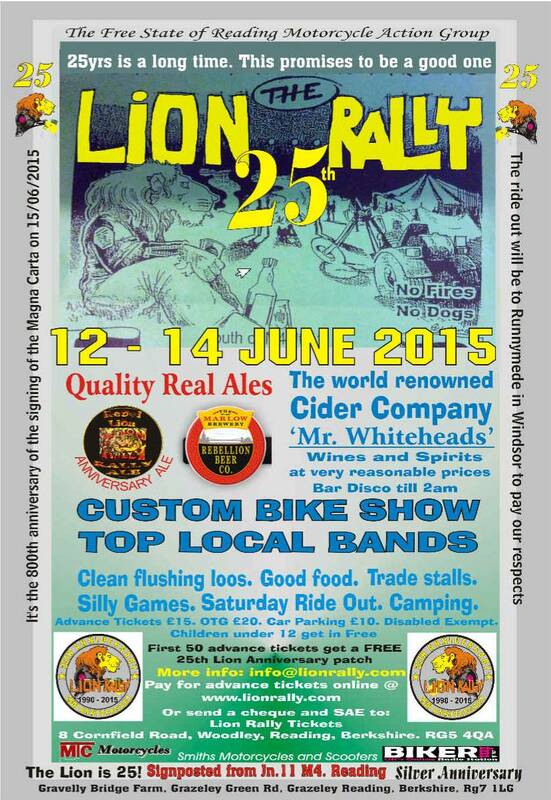 Reading MAG's 27th Annual Lion Rally. 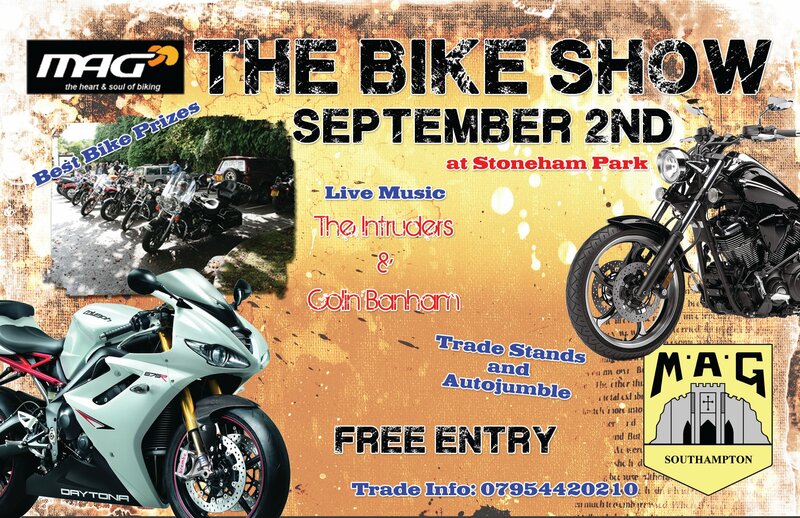 £15.50 advance tickets, £20 on gate, Cars £10..
Venue: Little Horsenden Farm, Princes Risborough, Buckinghamshire HP27 9BB. Popham Airfield, North side of A303, halfway between junctions with the A34 and M3. 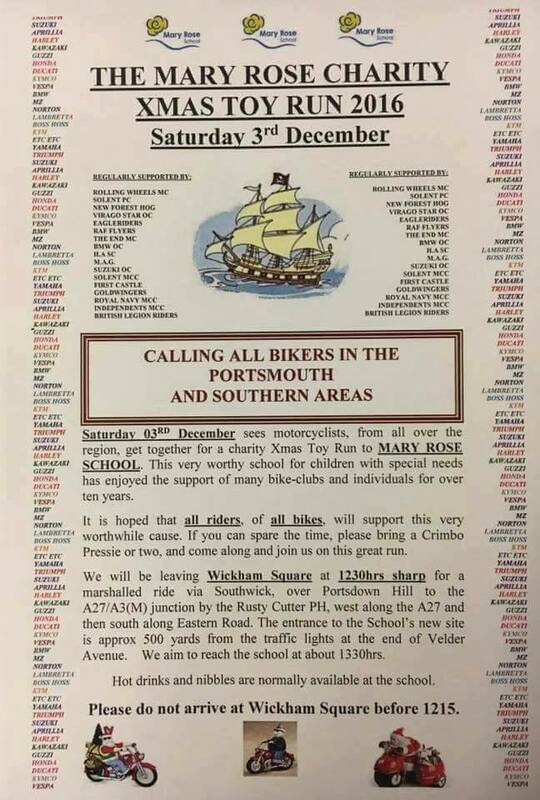 Mary Rose Charity Christmas Toy Run Meet at Wickham Square at 12:15 to leave at 12:30 sharp. the meeting will be held at the Three Crowns on the same date. Meet at Lakeside cafe, Eastleigh, SO50 5PE at 10 am for breakfast. Sunny Side, Mortimers Lane, Eastleigh, SO50 7EA at approx 12 noon. 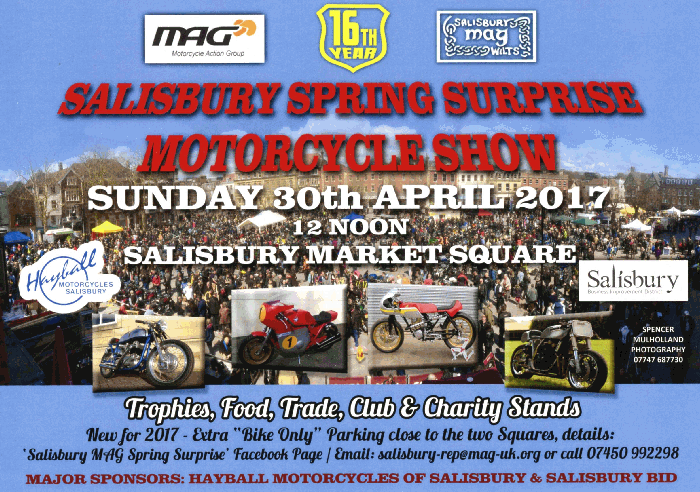 Salisbury MAG's 15th Spring bike show starts at 12:00. Fundraising event for Air Ambulance. Tickets £10. 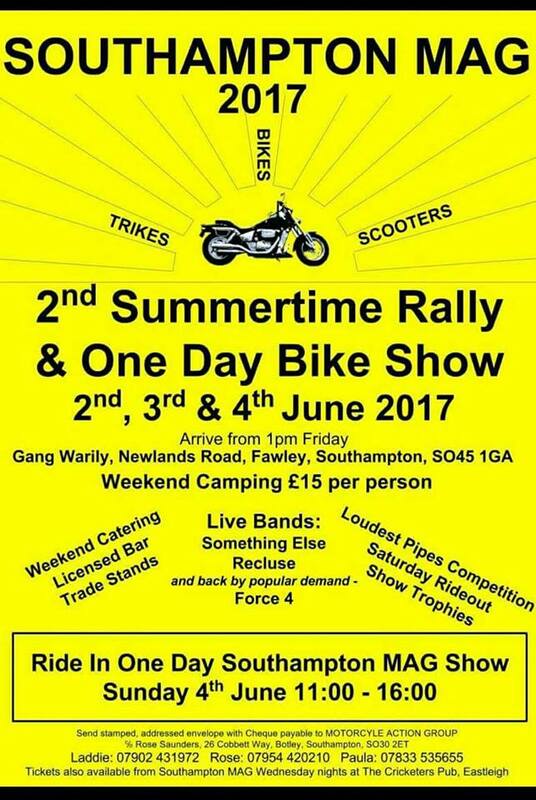 Rally and Bike Show Southampton MAG Rally & Bike show starts 3rd June, tickets £12. 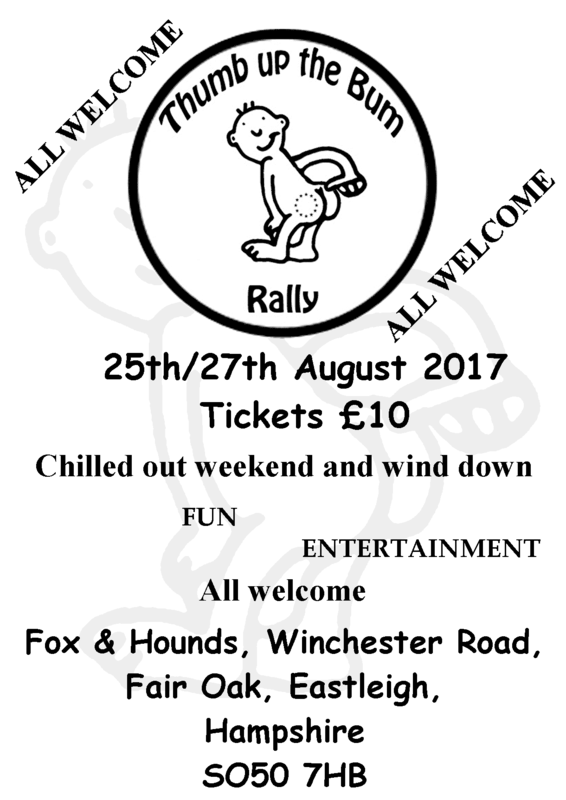 Reading MAG's 26th Lion Rally. £15 advance tickets, £20 on gate. 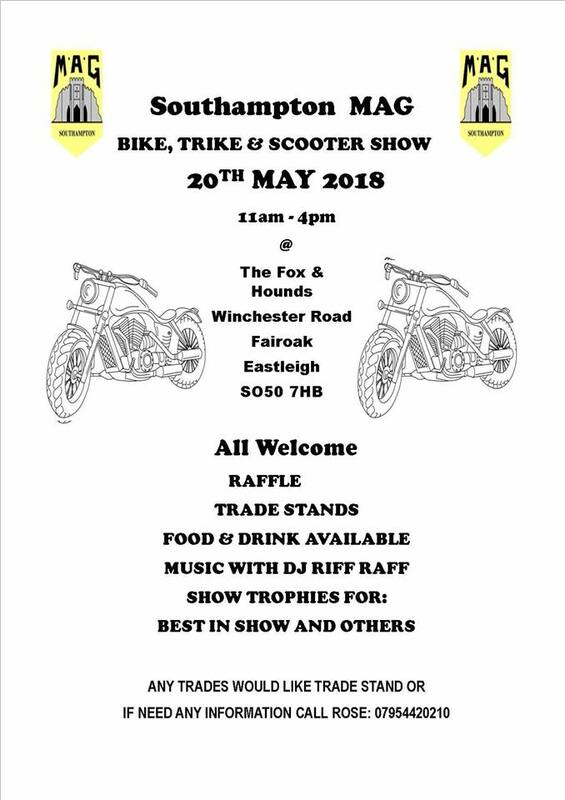 WeBe MAG's Bike Show, set up in aid of the Dog's Trust, Newbury. 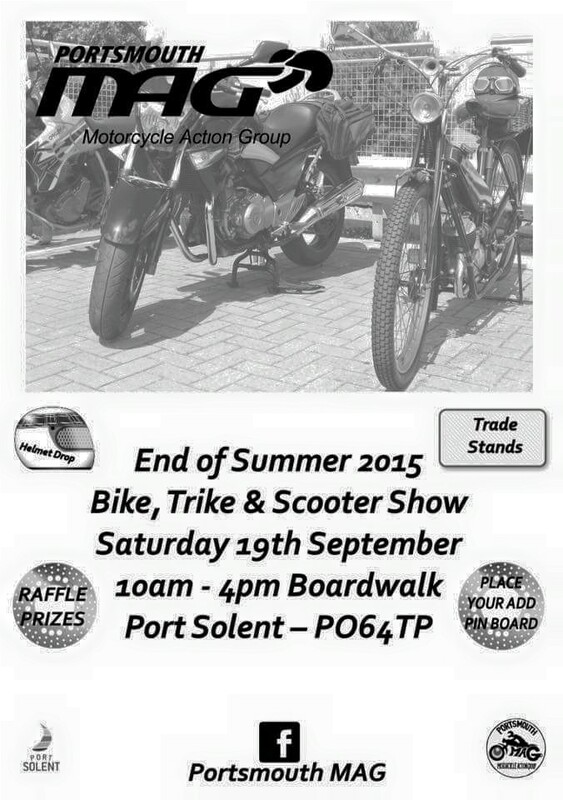 Starts at 11am with Side stalls, Trade stands and Raffle. For costs see link to the right. Southampton's meal starts at 19:30, cost is £10 each. 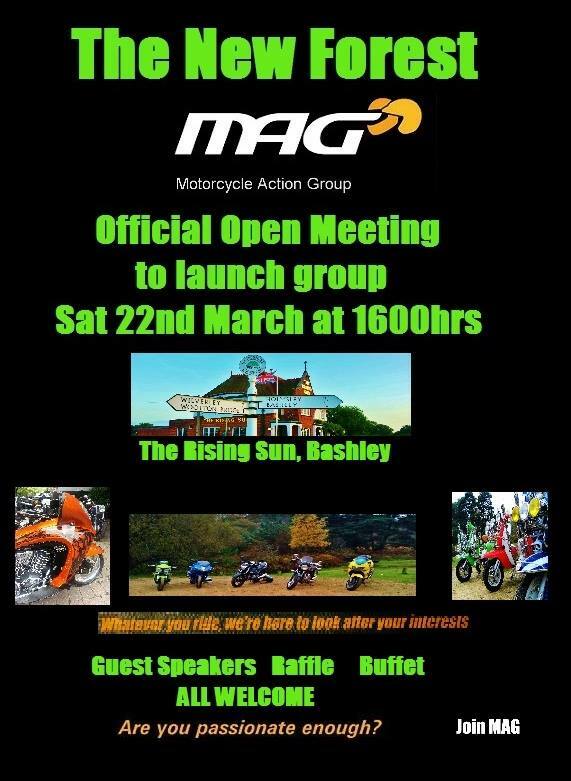 Salisbury MAG's Annual General meeting starts 19:00. 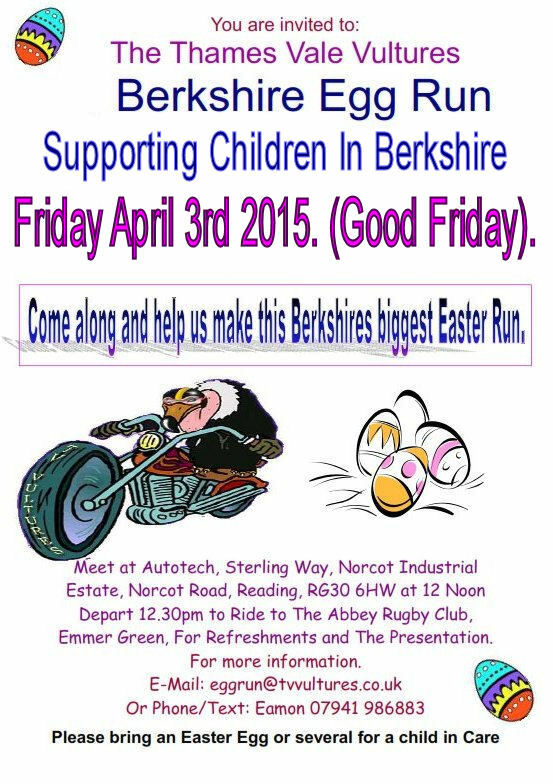 Thames Vale Vultures are putting on this Berkshire Easter Egg Run. 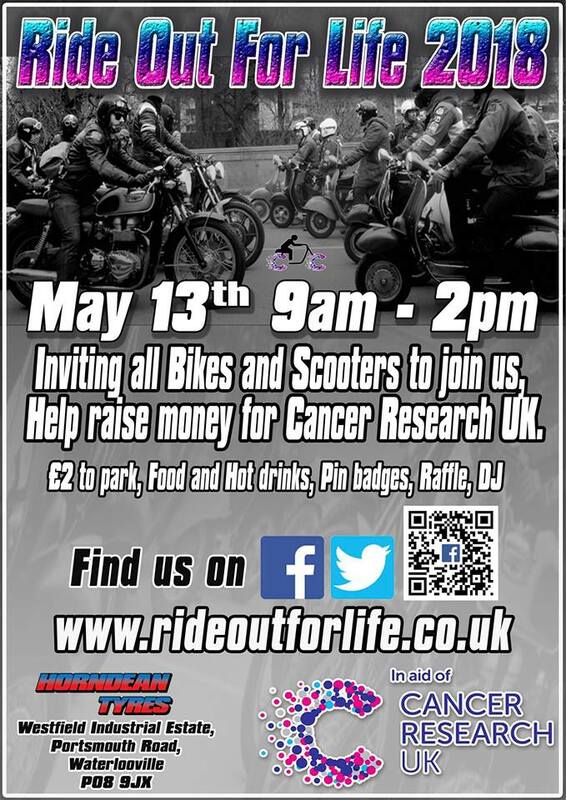 Meet up at 12:00 for 12:30 start for ride to Abbey Rugby Club, Emmer Green. 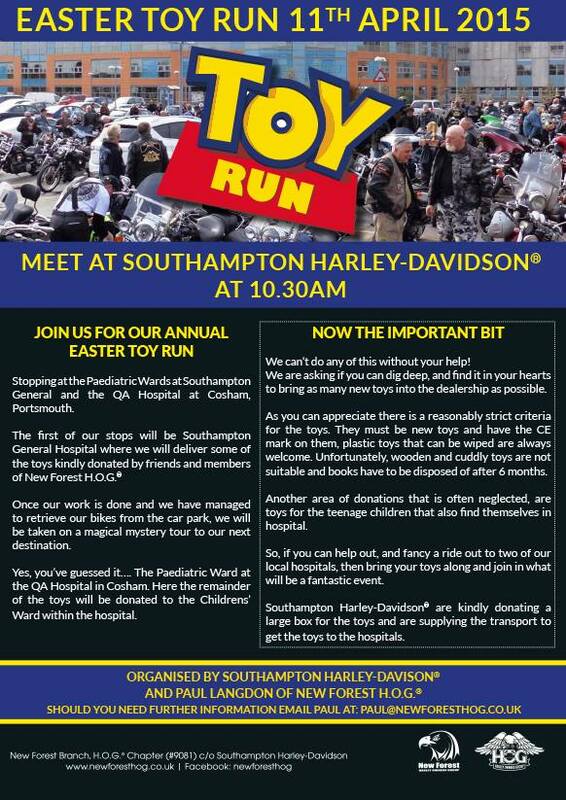 Southampton Harley-Davidson and New Forest H.O.G. Runs to Southampton General and Cosham QA hospitals. 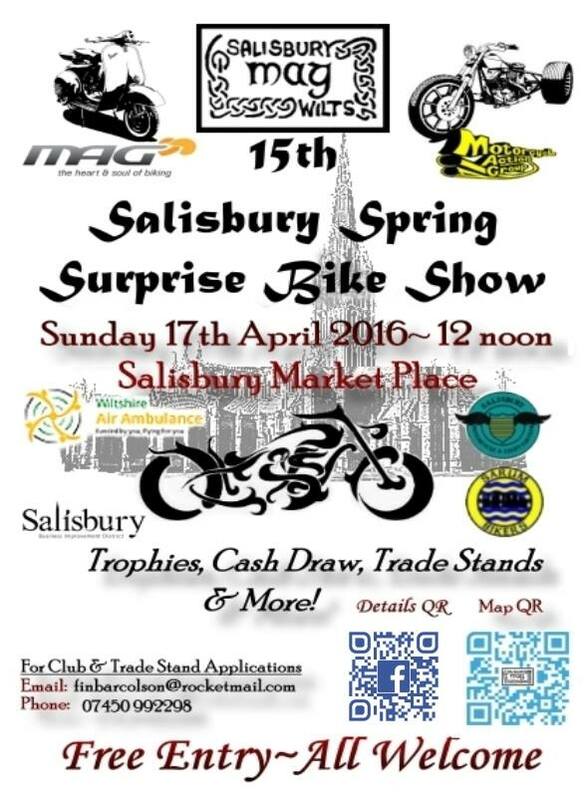 Salisbury MAG's 14th Spring bike show starts at 12:00. 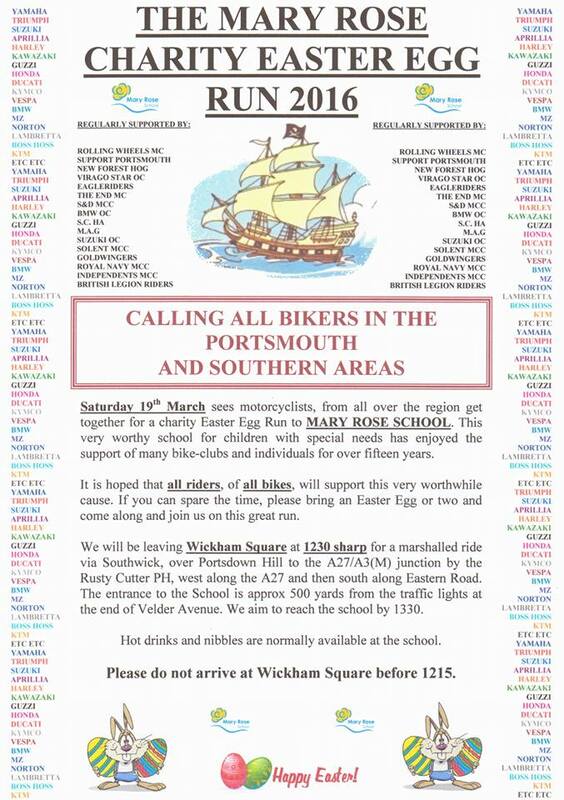 Portsmouth MAG are holding a Skittle Evening from 19:30 onwards. 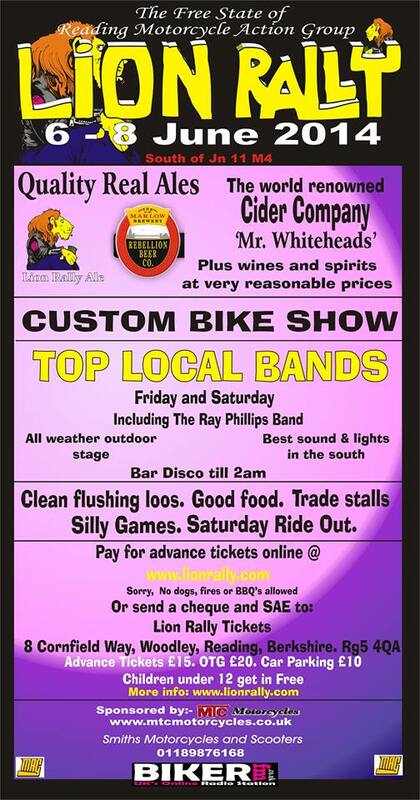 Venue: The Milburys, Salt Lane, Beauworth, New Alresford SO24 0PB. Other groups welcome to make up teams for a challenge. NABD's 24th You've Been Nabbed Rally. 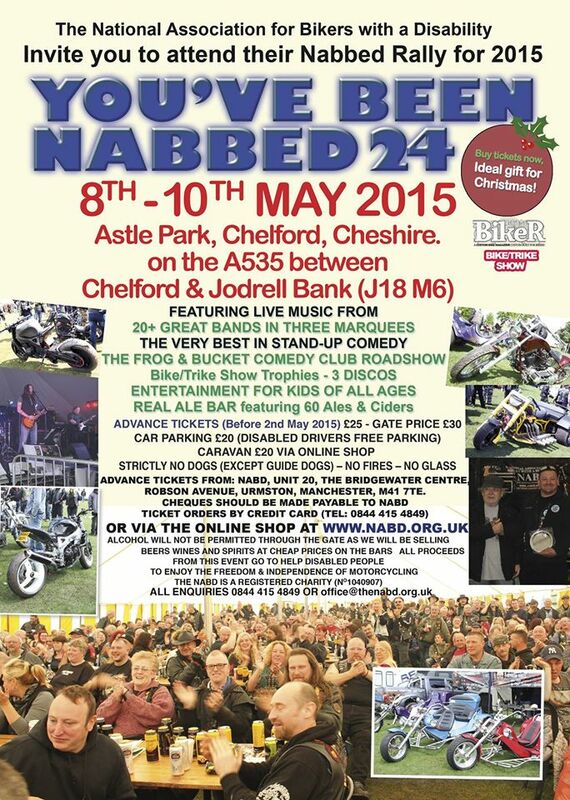 Venue: Astle Park, Chelford, Cheshire. motorcycles older than 14 years. 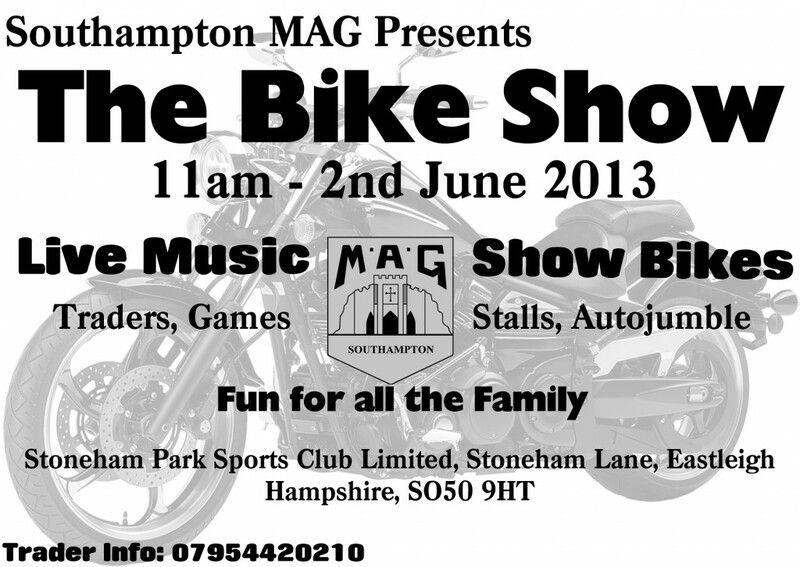 Southampton MAG Bike Show Southampton MAG Bike show starts at 11:00. We are hoping to re-schedule this show later in the year. 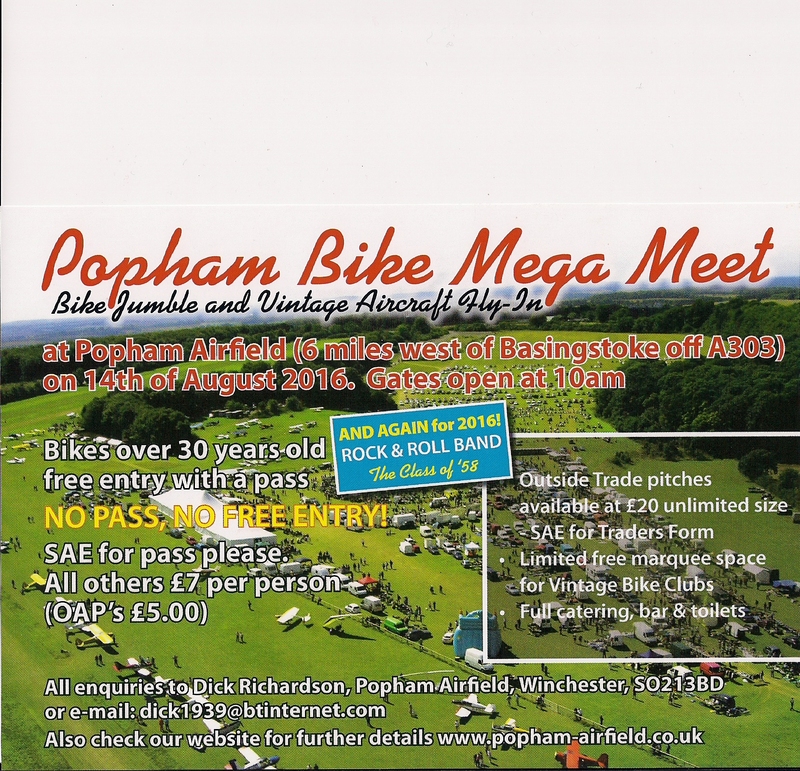 Popham Bike Mega Meet Popham Airfield, North side of A303, halfway between junctions with the A34 and M3. Memorial Run Greater London's Regional MAG 2014 Fred Hill Memorial Run. Cricketers, Chestnut Avenue, Eastleigh at 09:00 to meet up at the Ace. Official launch and Annual General Meeting of The New Forest MAG. Isle of Wight MAG's Annual General meeting starts 19:00. 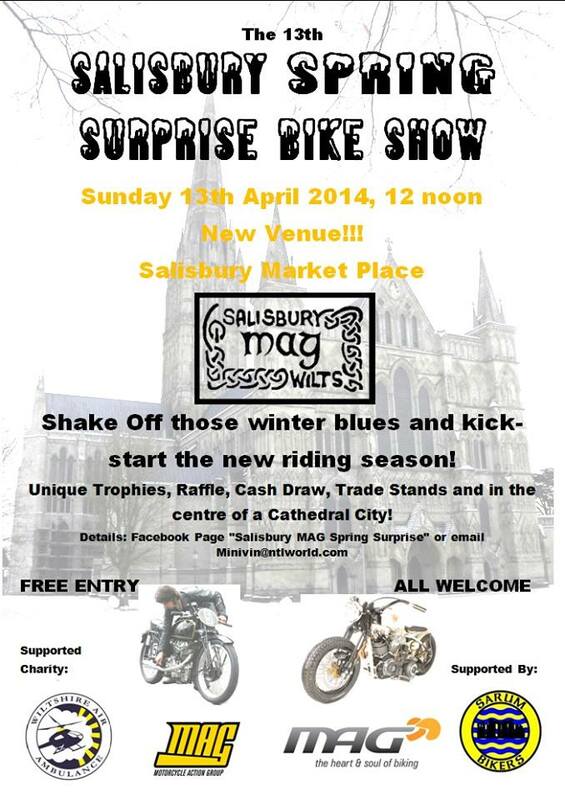 Salisbury MAG's 13th Spring bike show starts at 12:00. Starts at 12:00. Overnight camping available £3 from evening 26th April. 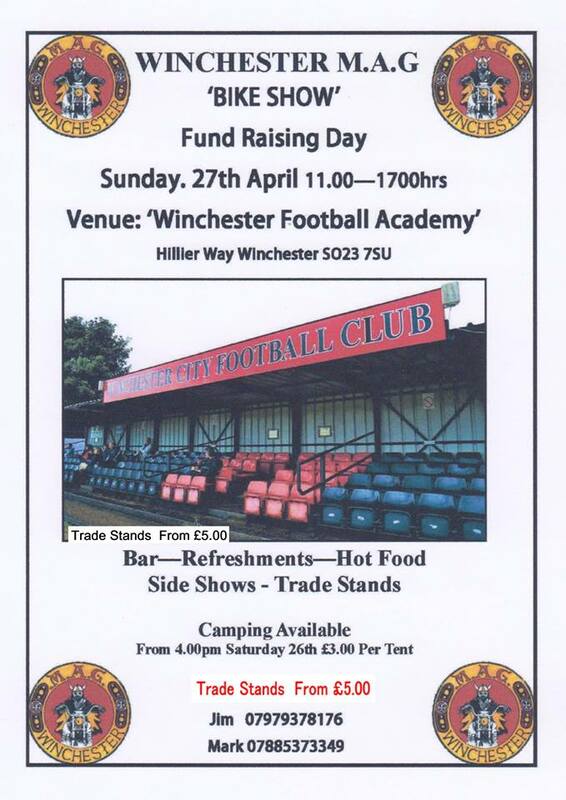 Venue: Winchester Football Club, City Ground, Hillier Way SO23 7SR. Meet at 19:30 for 20:00 start. 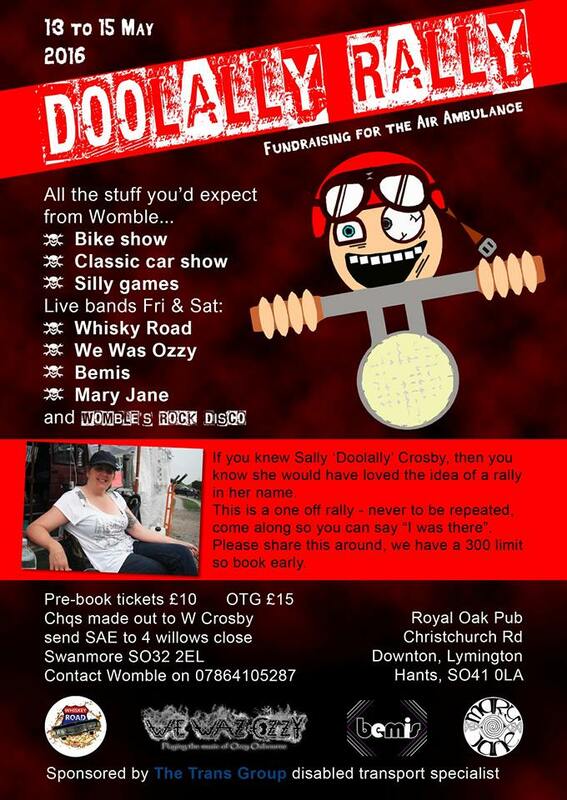 Venue: The Bold Forester, Soberton Heath. 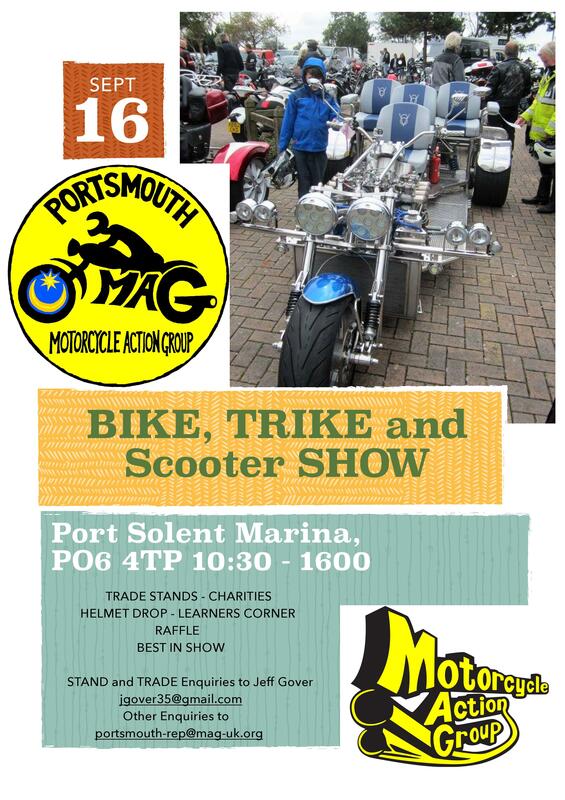 Southampton MAG Bike show starts at 11:00. 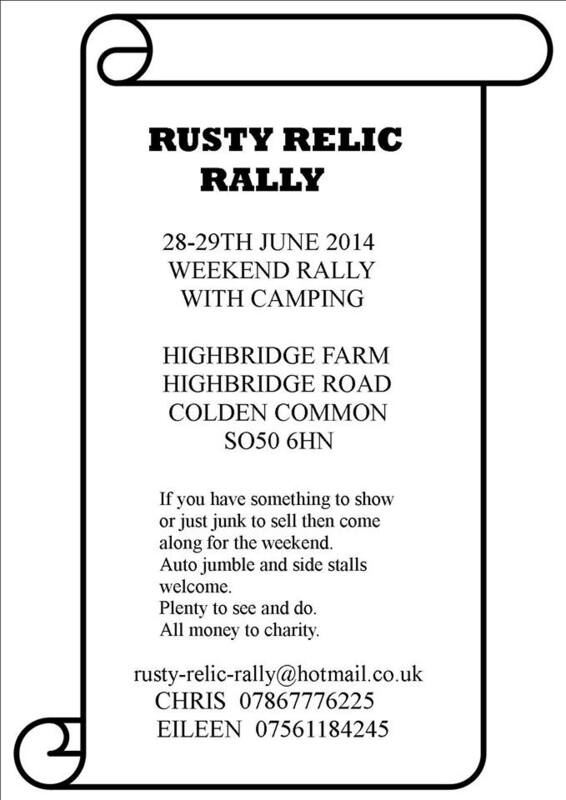 28th-29th June Rusty Relic Rally Weekend rally with camping, show and auto-jumble. 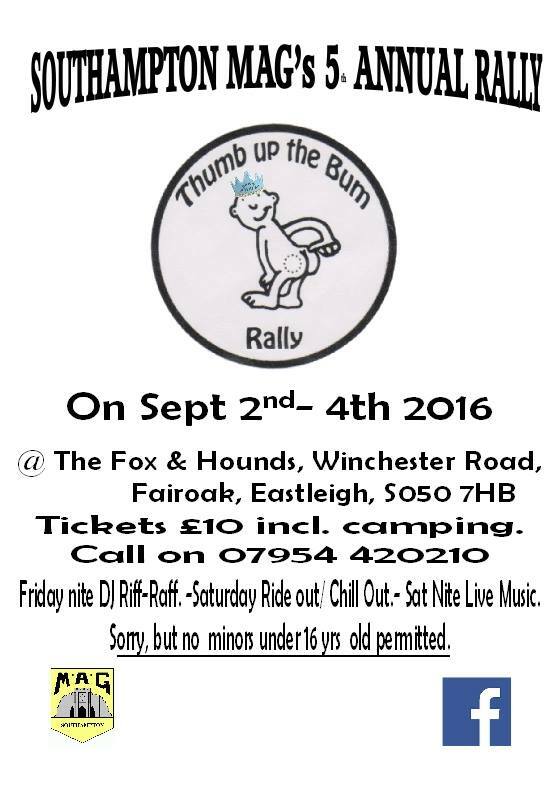 Southampton MAG's Thumb up the Bum Rally. Music - DJ on Friday, Live Music on Saturday. 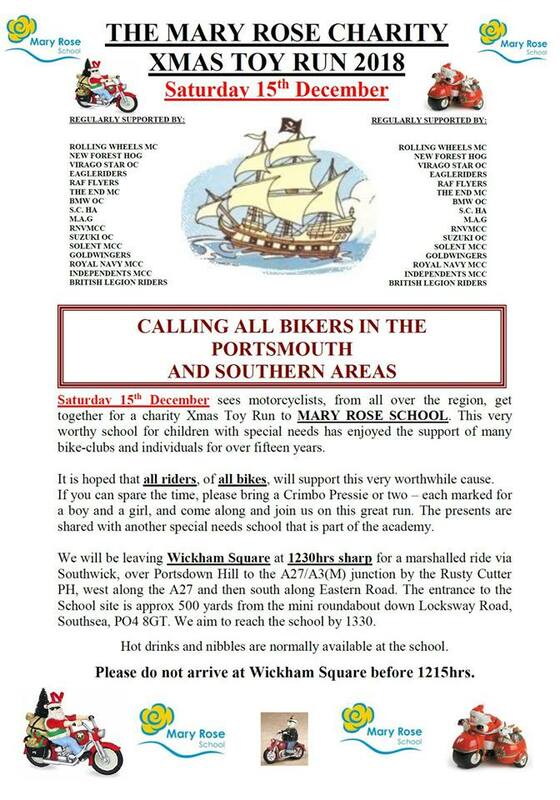 Starts from Wickham Square at 12:30, aiming to reach the school by 13:30. Riders Join Ringwood Lantern Parade starting at 17:00. Basingstoke and Salisbury running to Jolly Farmer, Winchester for 09:40. 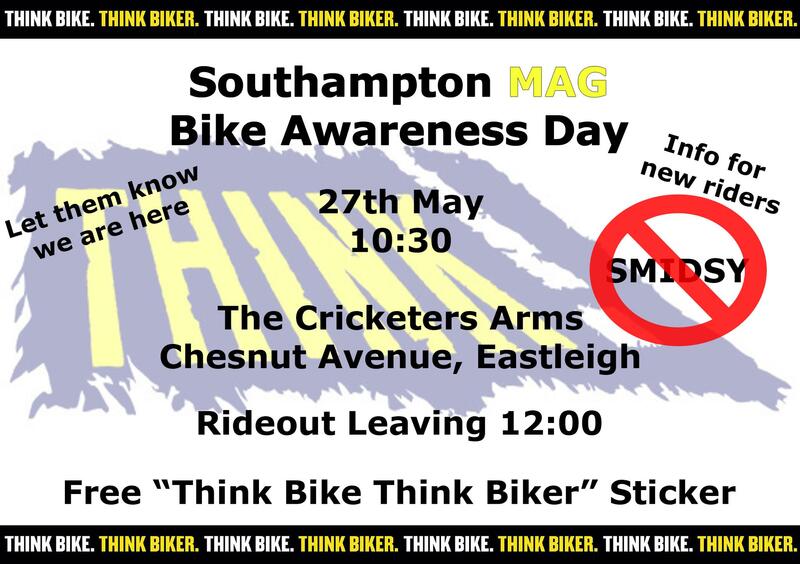 Cricketers, Eastleigh for 10:30, joining up with Southampton MAG. Portsdown Hill for 11:30, joining up with Portsmouth MAG. Starts from Upper Beeding, running to Lewes Prison. 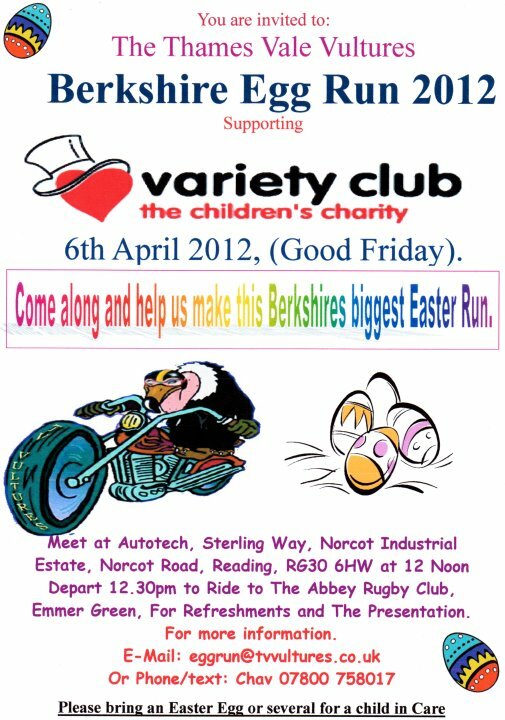 Thames Vale Vultures are organising the Berkshire Egg Run in aid of the Variety Club. Meet from 12:00, depart 12:30 to the Abbey Rugby Club, Emmer Green. 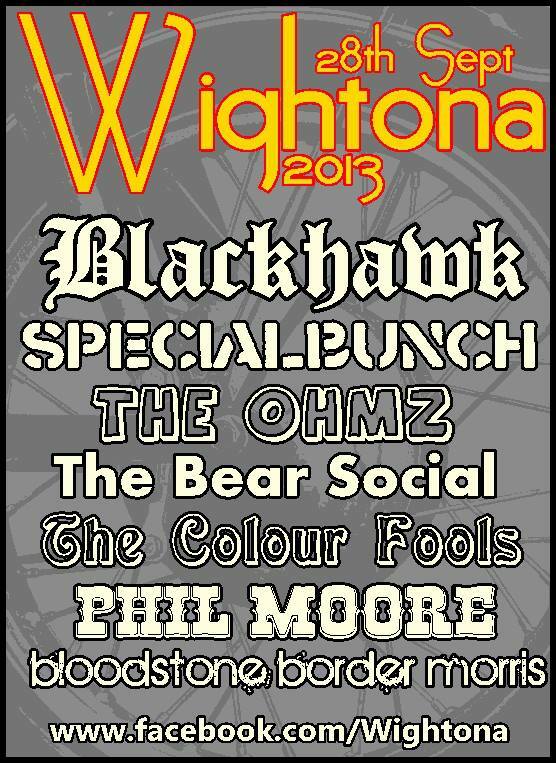 Isle of Wight MAG's Annual General meeting starts 20:00. 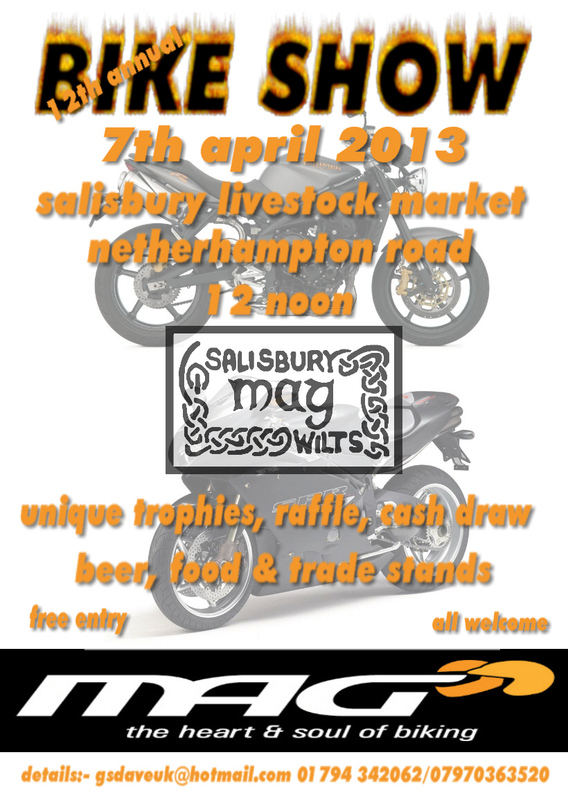 Salisbury MAG's 12th Spring bike show starts at 12:00. Please note: No pets are allowed on this site. Greater London MAG Annual Ace Day, celebrating MAG's 40th year. and Portsmouth Oncology Cancer Care. 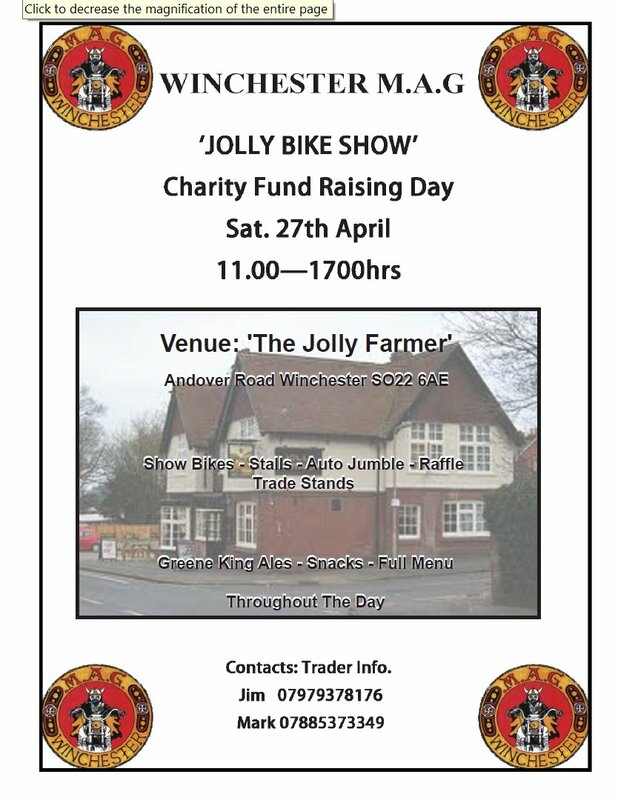 Winchester MAG's first Jolly Bike Show. Transport Festival 2012 starts at 11:00. 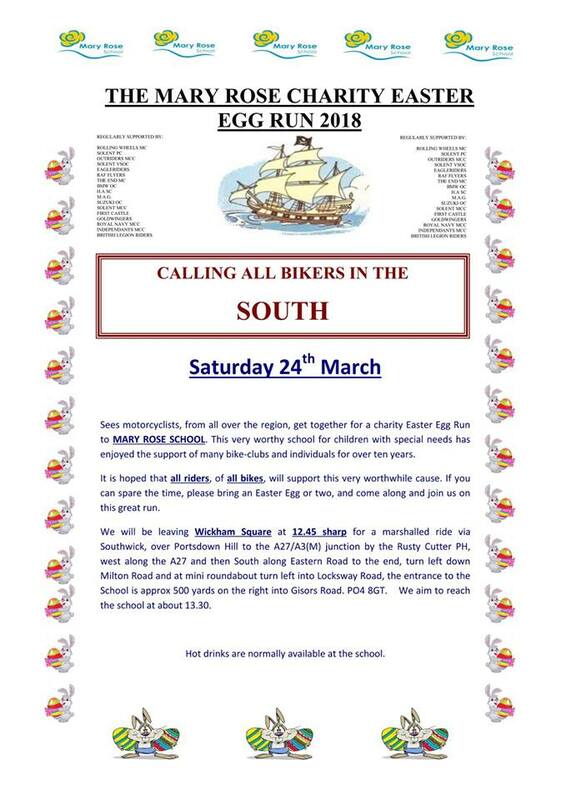 Venue: West Meon Pub, West Meon GU32 1JX. Land rovers, Classic cars, Tractors, Side stalls, Stationary engines, Lorries, Custom cars. 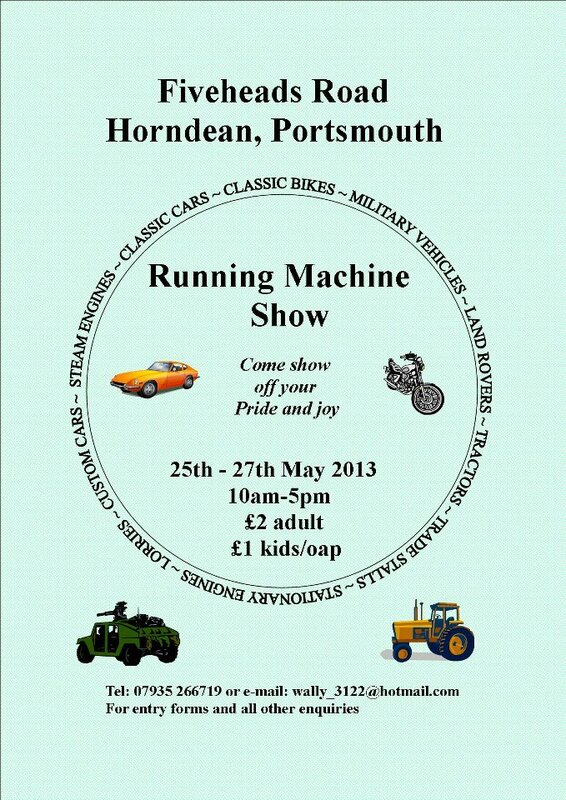 Venue: Fiveheads Road, Horndean, Portsmouth. 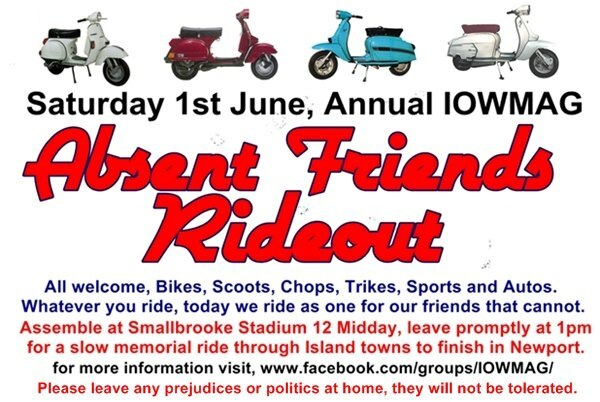 Assemble from 12:00 at Smallbrook Stadium for 13:00 start. For more details see flyers. 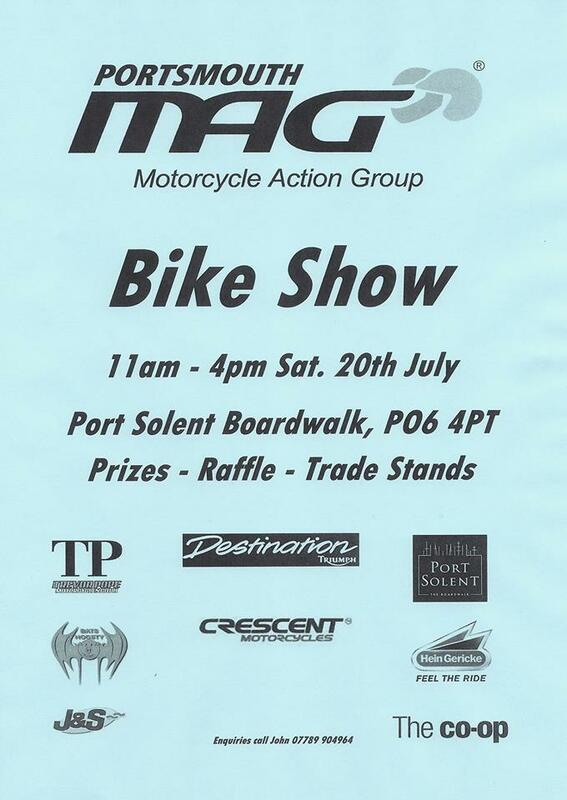 Southampton MAG Bike show starts at 12:00. Surrey Fire & Rescue Service. Starts 10:00. Venue: Little Horsenden Farm, Princes Risborough, Buckinghamshire. 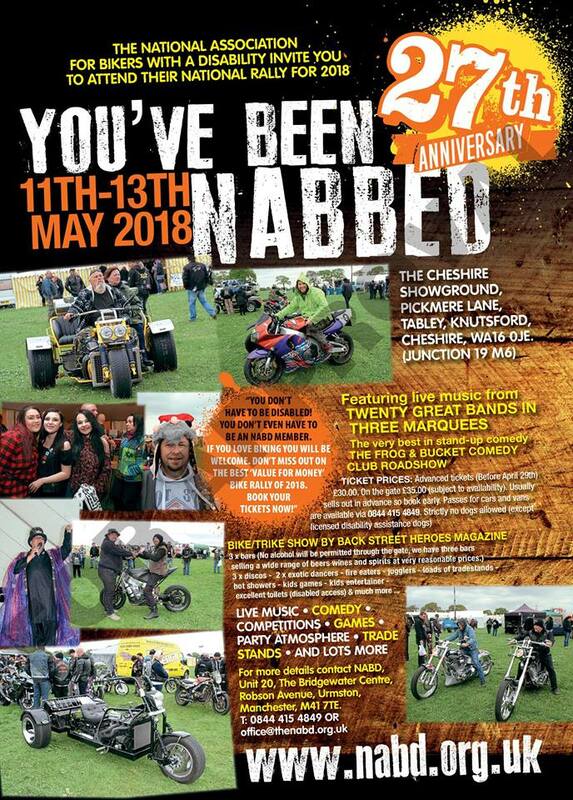 those bikes, trikes, chops and rat bikes considered to be the best by the judging panel. MAG's established demo ride to the centre of Birmingham. asked for a minimum donation of £5 per bike per day. More details and schedule see link. of July, and some 2,500 miles and 9 days later it will finish at the same point. Starts 12:00 runs until late. Lots of attractions including Quads, Bikes and Trucks. Music Friday and run-out & DJ on Saturday. 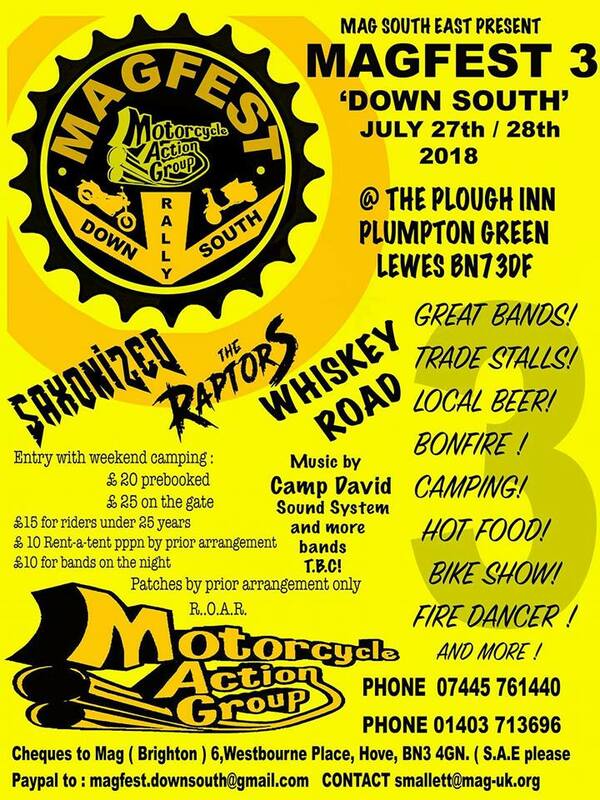 £10.00 includes rally pack and camping. 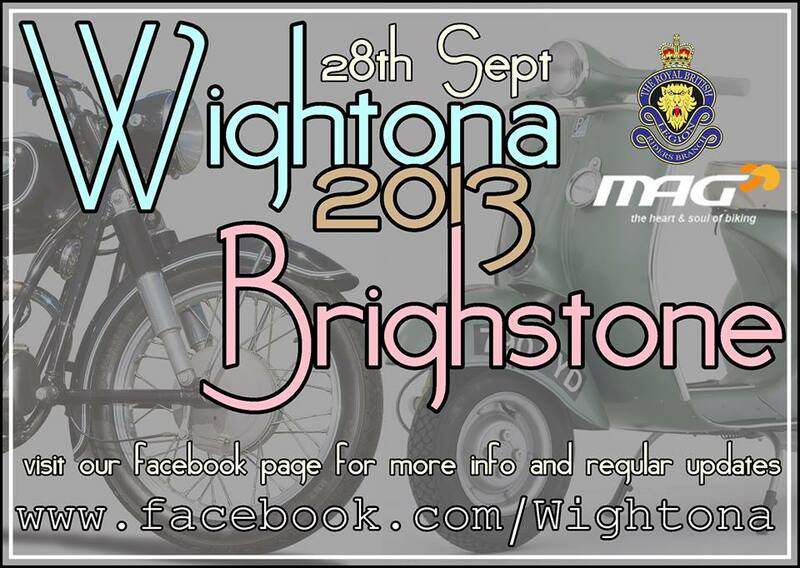 Isle of Wight MAG and Royal British Legion Riders event. 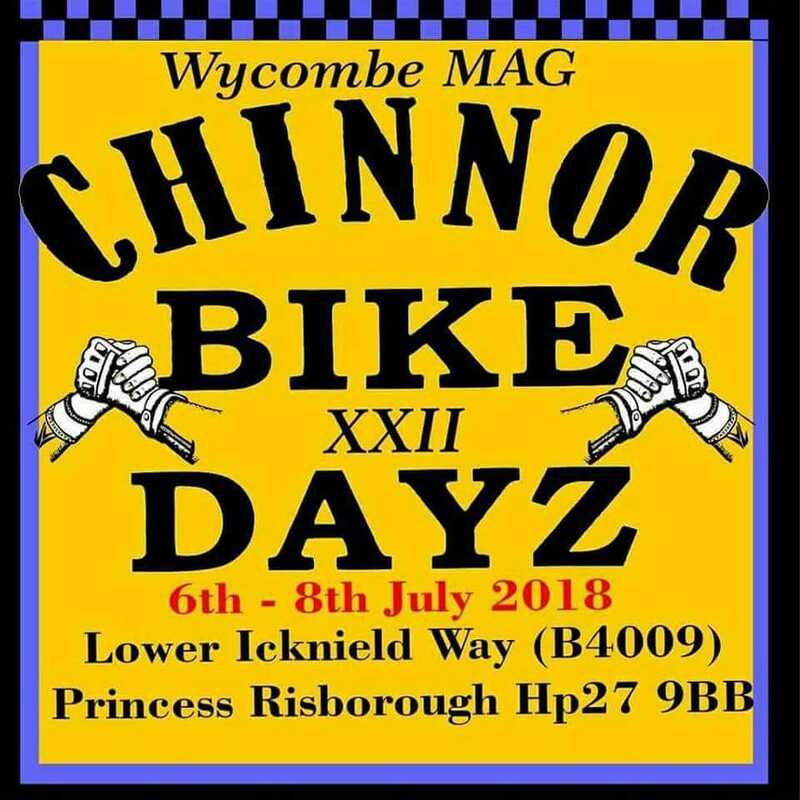 Starts at 11:30 from Winchester Park and Ride South. Runs out to Loomies and back past Winchester Prison. Annual MAG Fred Hill memorial run starts at 12:00. Starts from the Ace Cafe finishing at HM Pentonville Prison. 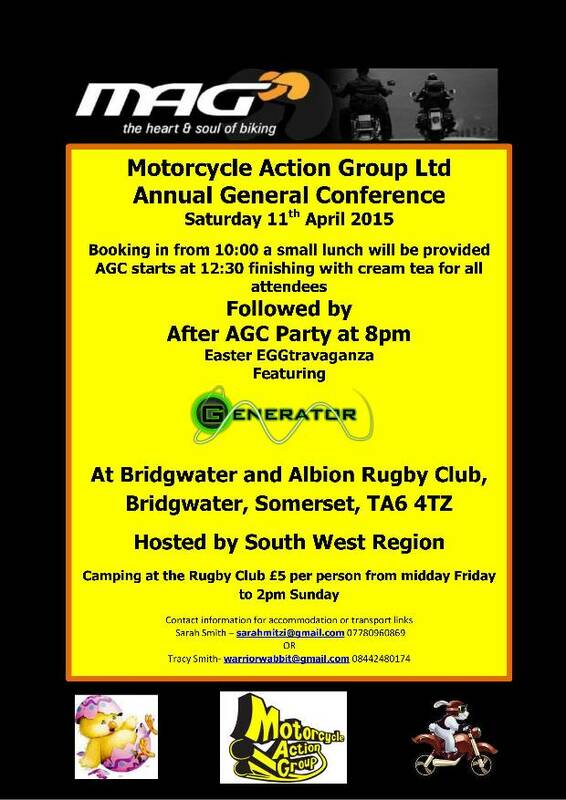 One of the largest trike events in the South of England at the Ace Cafe. 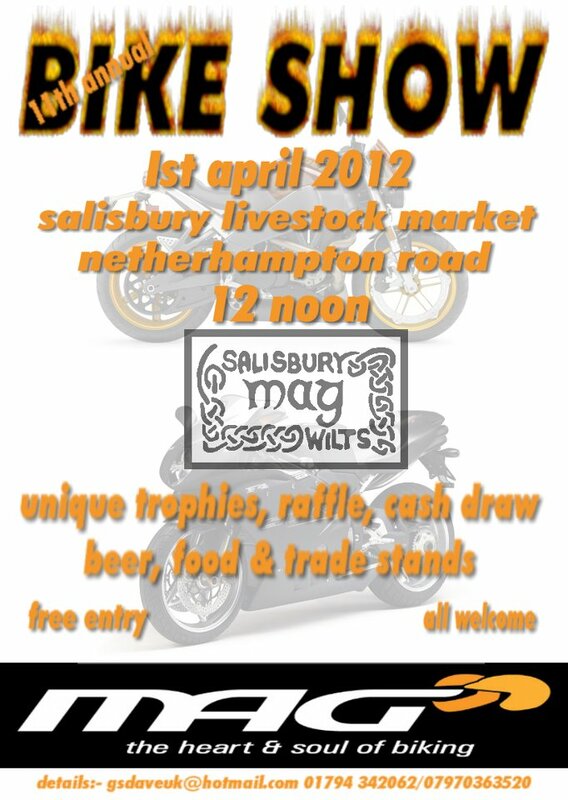 Salisbury MAG's 11th Spring bike show starts at 12:00. 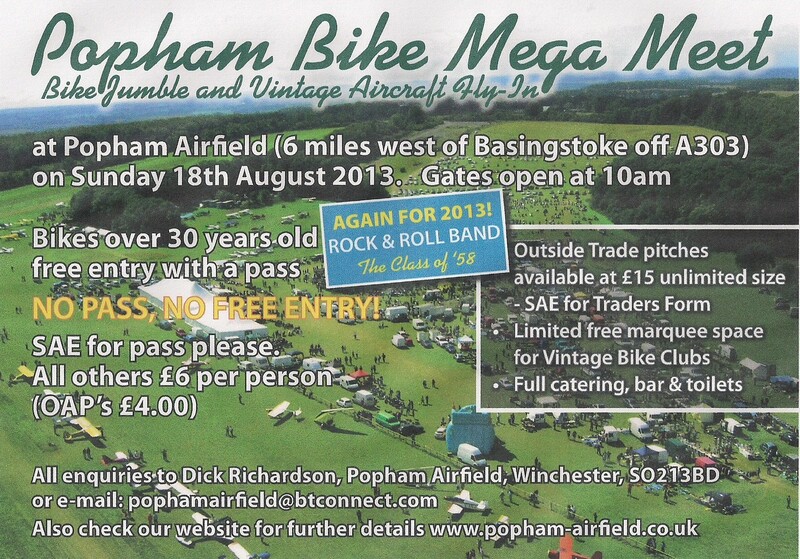 Venue: Chiltern Park Aerodrome, Ipsden, Oxon. OX10 6AS. Valid membership card required for delegates. Free camping from midday Friday. Free live bands Friday night. Stalls & hot food available. Dirty Donkey Biker Party Saturday night. Sunday ride out to the Ace Cafe for re-launch of London MAG. Re-launch of the London MAG group, at the Ace Cafe starting at 12:00.
and Light Car Club. 09:30 for 11:00 start. 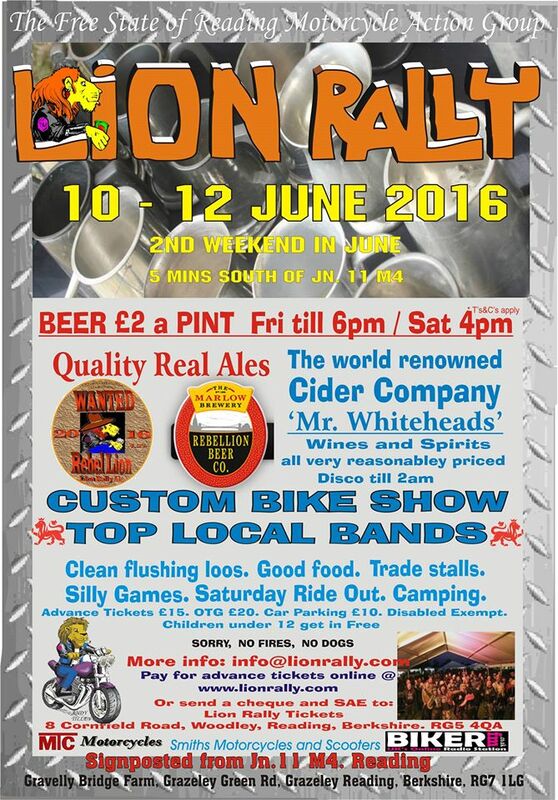 Entry fee £6 on day, £5 if purchased in advance. 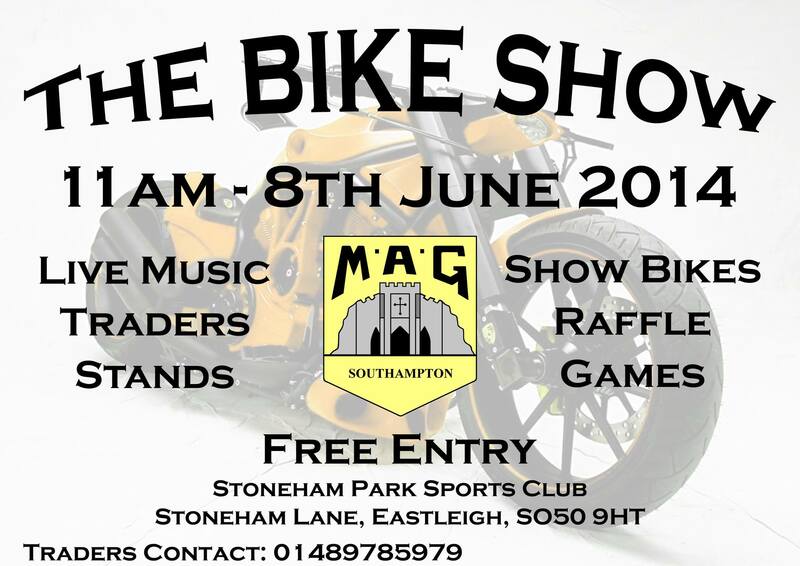 Southampton MAG Spring bike show starts at 11:00. 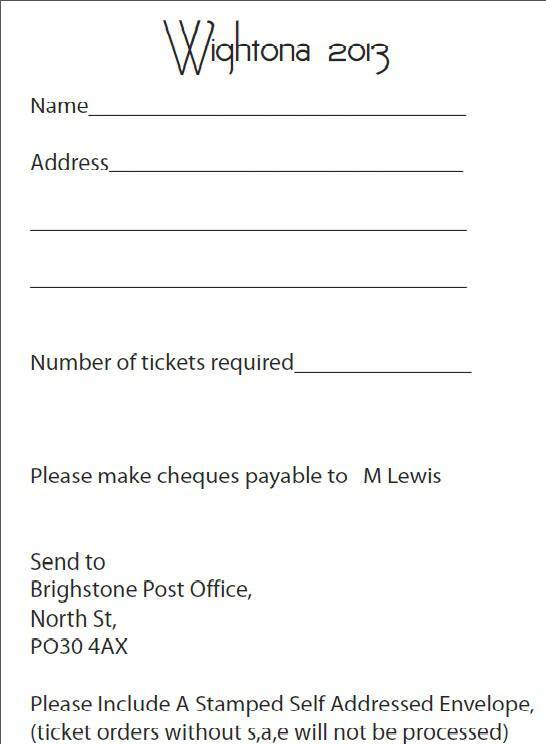 Tickets £10 in advance, £11 by PayPal, or £15 on gate. 3B's Rally Club present their Custom and Classic . Demo will start from Rownhams Services Eastbound on the M27, Depart 12:00 midday. 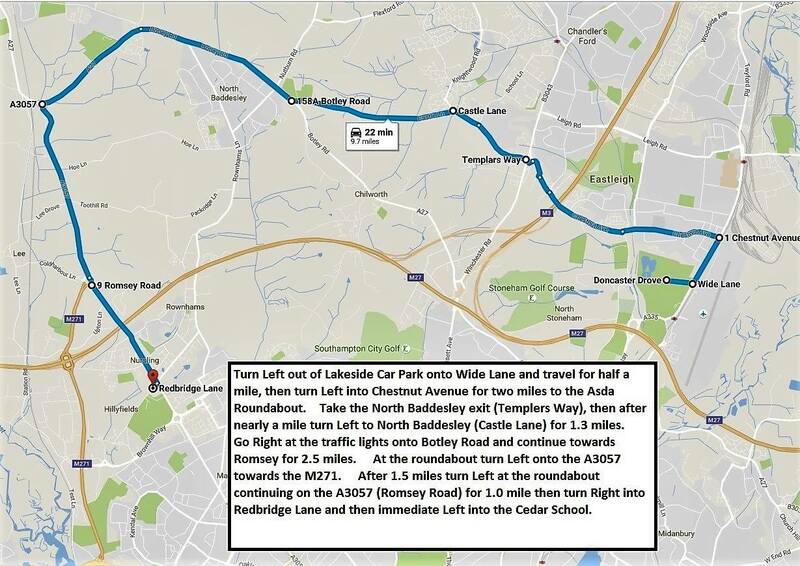 Demo will travel eastbound to the M3 and then northbound as far as the M25 where it will disperse. 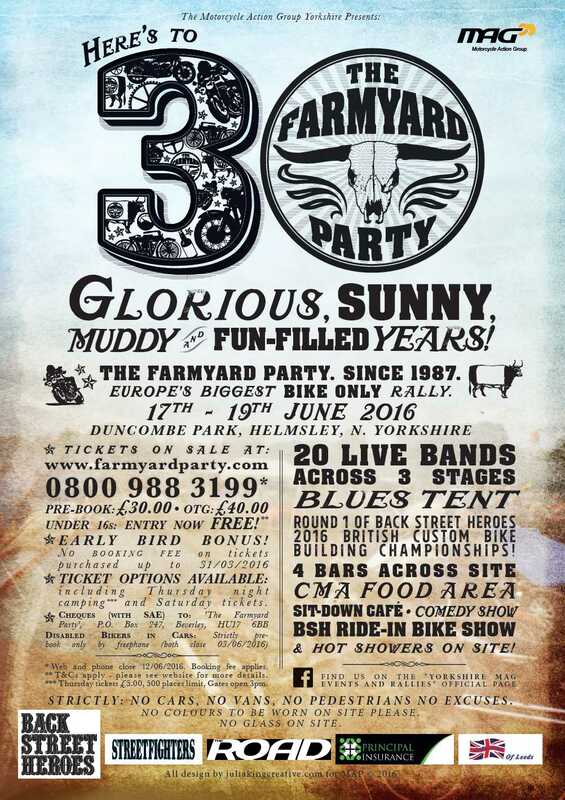 Venue: Little Horsenden Farm. Princes Risborough. Buckinghamshire. Southampton MAG's Thumb up the Bum Rally starts 17:00 20th July. Music Friday and Saturday and run-out on Saturday. 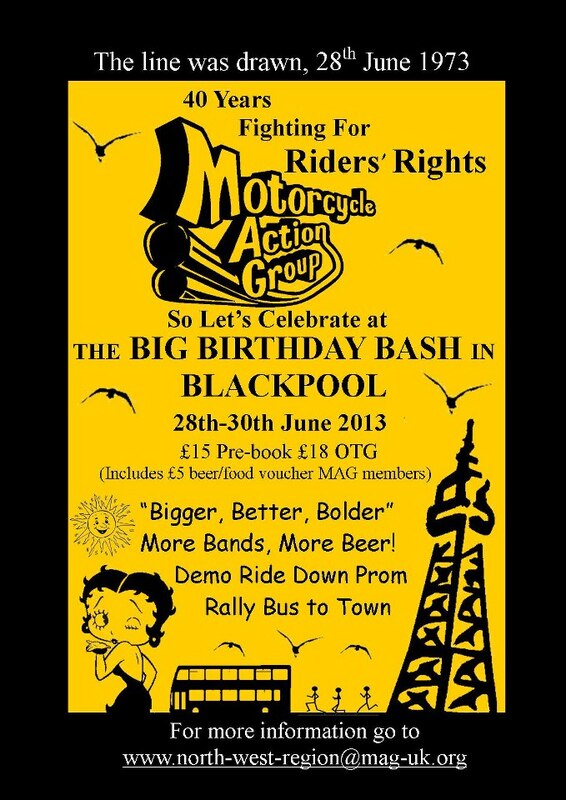 £15.00 includes rally pack and camping. Start and Finish at Dave Death Motorcycles, Carisbrooke. 12:00 for 13:00 start. £5.00 per poker hand team. Prizes for winners. 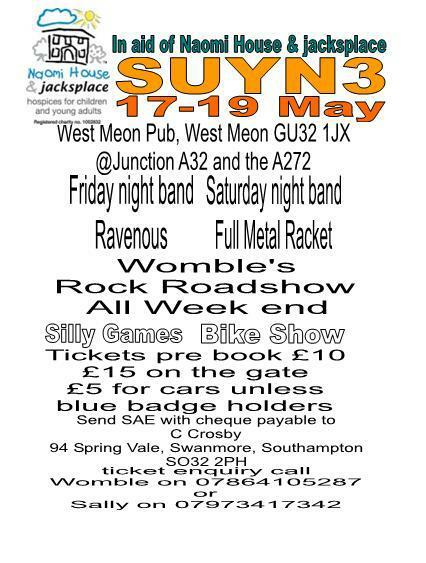 Proceeds after prizes to Hants & IOW Air Ambulance. 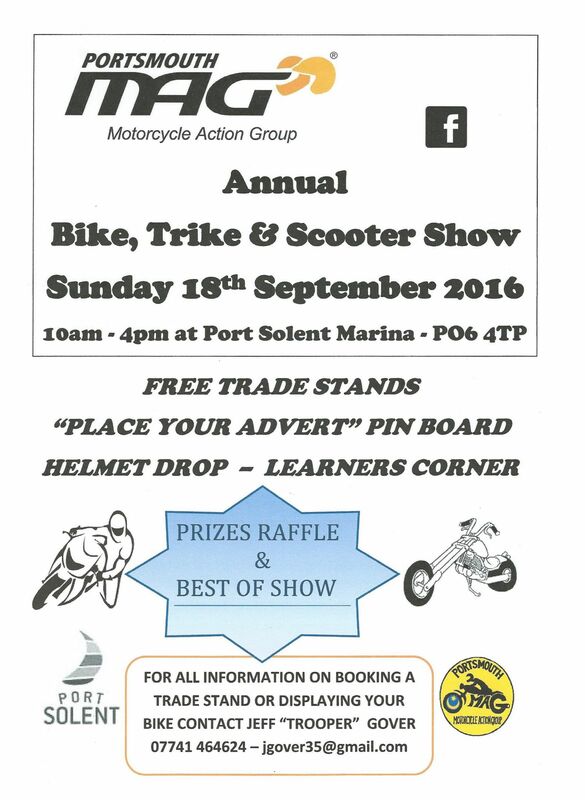 Southampton MAG Autumn bike show starts at 11:00. 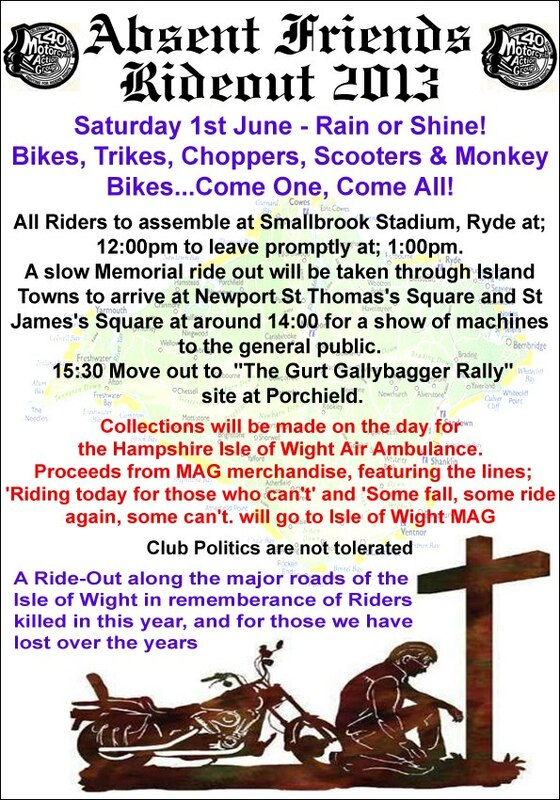 Isle of Wight MAG Rally starts at 15:00 running through to 01:00. Venue: Smallbrook Stadium near Ryde. 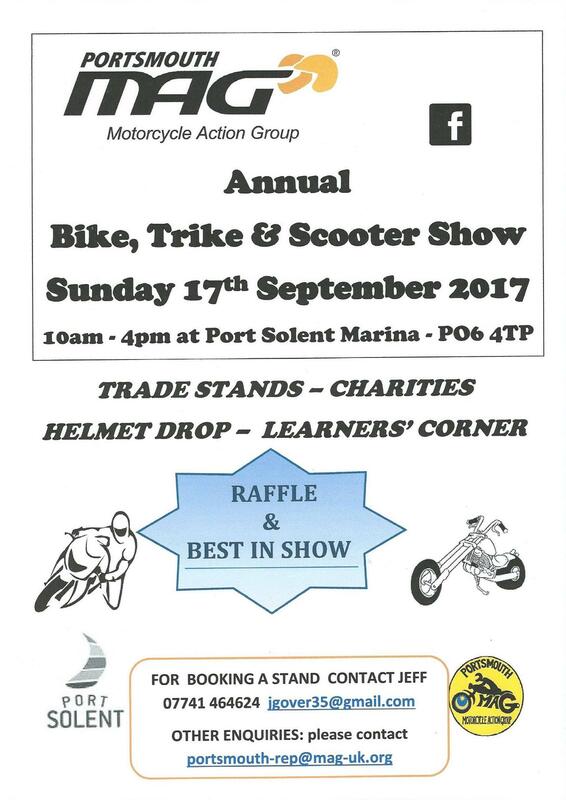 Afternoon bike show with prizes for best bike/trike plus other silly stuff. Evening entertainment with Blackhawk, plus rock disco. 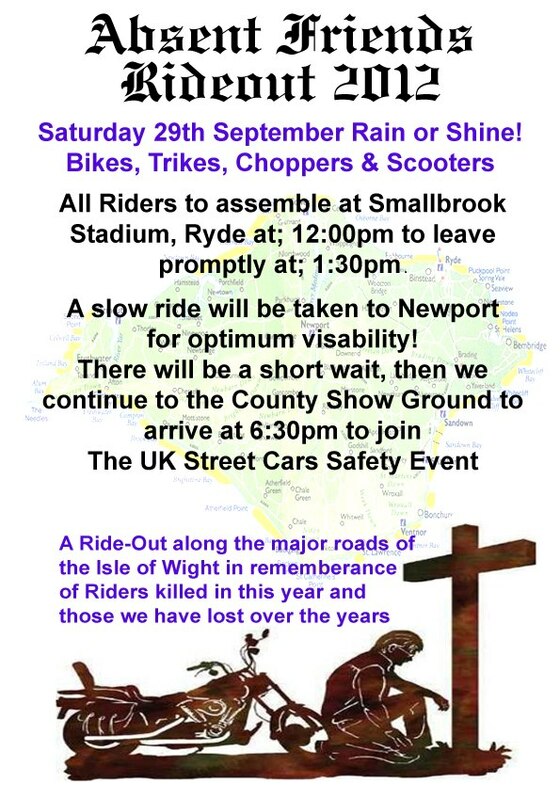 Form up from 12.00 at Smallbrook Stadium, Ryde from 12:00, for start at 13:30.
where we will wait for a while. with UK Streetcars for their national road safety event. 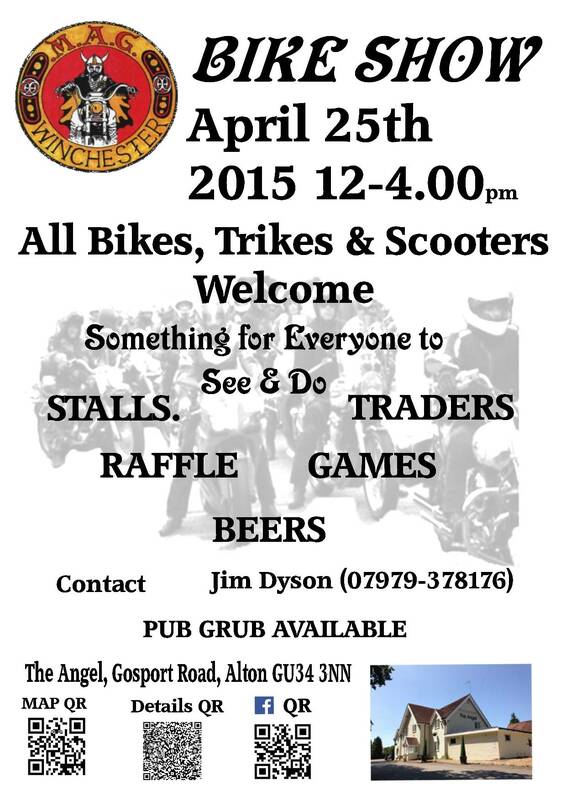 All welcome, MAG or not, bikes, trikes, scoots, the more the merrier! John is leading a run from the Cricketers in Chestnut Avenue, Eastleigh. 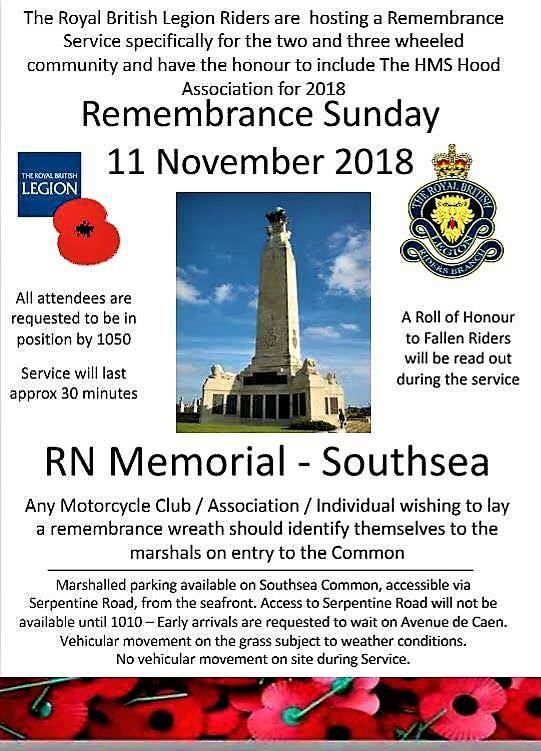 at 10:10 to go to the RN Memorial Service in Southsea. At the Peking Phoenix Chinese Restaurant, Eastleigh from 19:00 onwards. 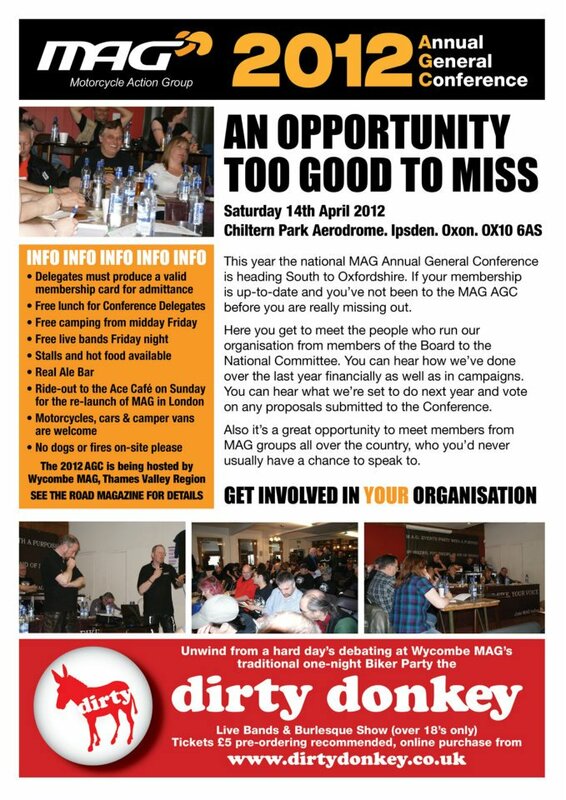 Salisbury MAG's Annual General meeting starts 19:30. Thames Valley Region MAG Fred Hill Run at 12:00. 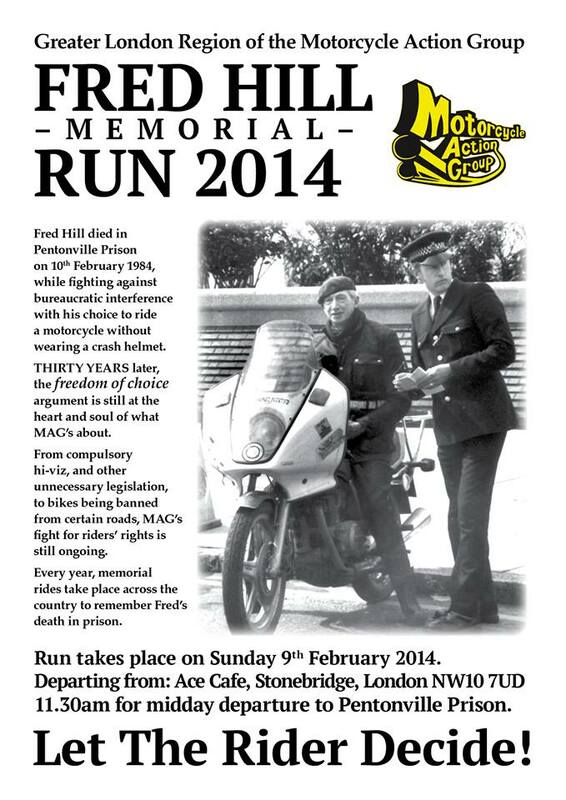 Annual MAG Fred Hill Run starts at 13:00. Starts from the Ace Cafe finishing at Pentonville Prison. 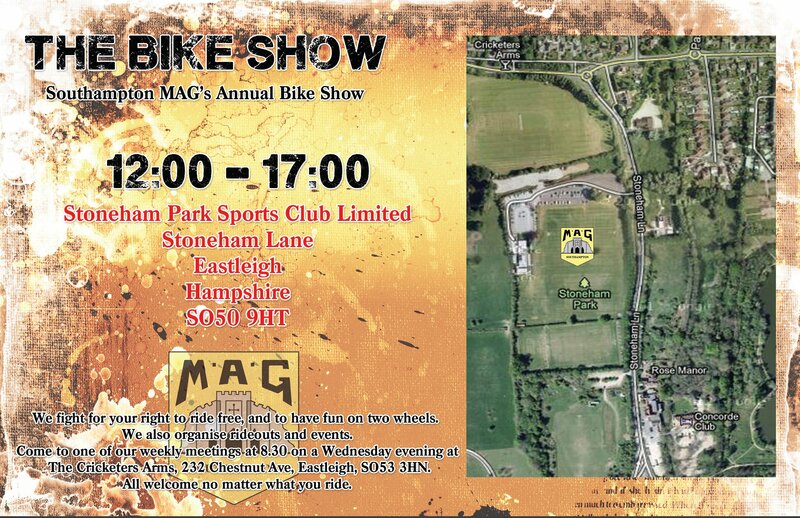 Salisbury MAG's 10th Spring bike show starts at 12:00. Venue: Beverley Rugby Club 155 Norwood, Beverley, East Yorkshire HU17 9HT. (Located behind the Lady Le Gros pub). Free Tea and Coffee plus sandwich on arrival. Free Buffet lunch 12.30pm. 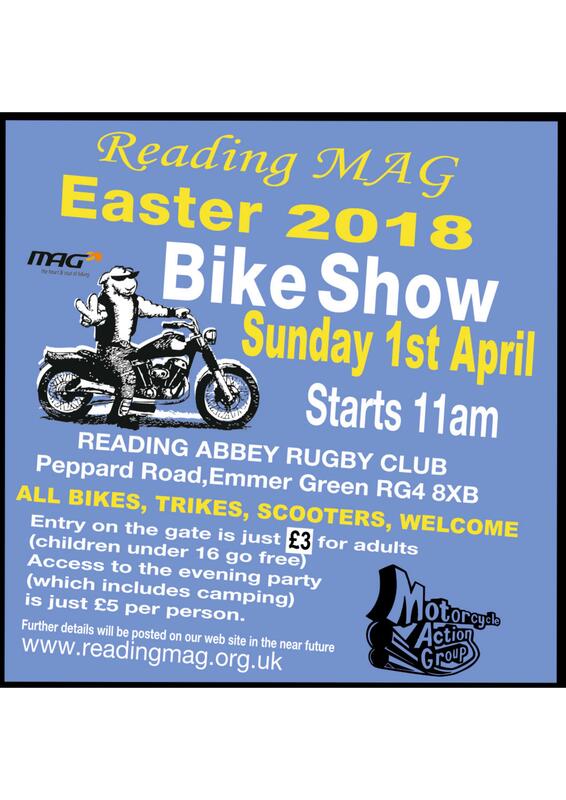 Reading's Easter Bike Show starts at 11:00. 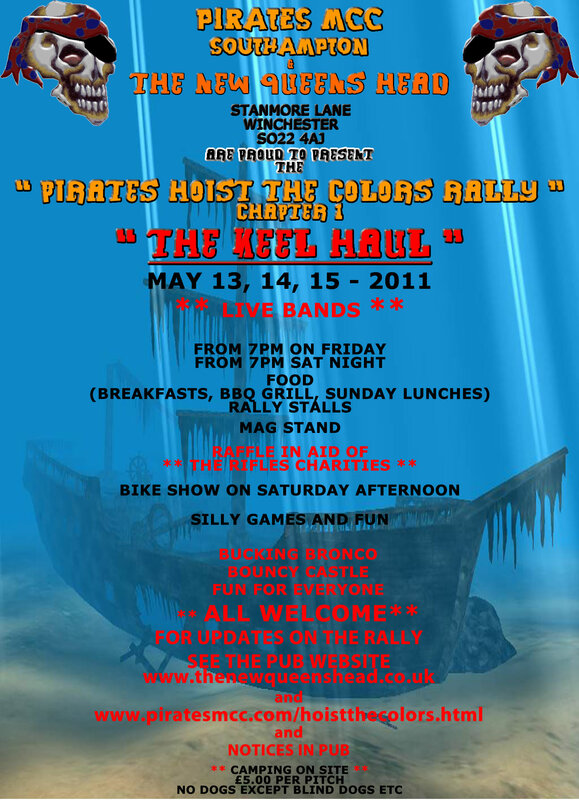 Pirates MCC "Pirates Hoist the Colours Rally", "The Keel Haul"
Pirates MCC "Keel Haul Rally" to be held at the New Queen's Head, Stanmore Lane, Winchester SO22 4AJ. Live bands at 19:00 on Friday and Saturday nights. 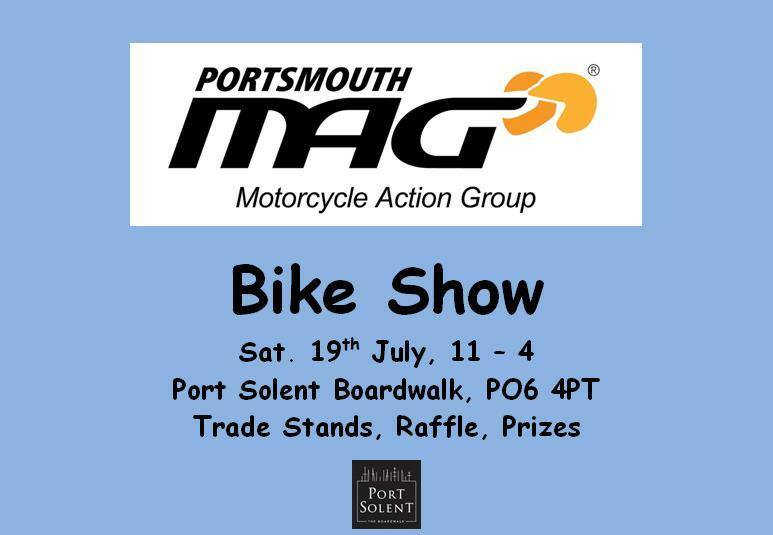 Supported by MAG, who will have a stand at the show. Breakfast, BBQ grill, Sunday lunches, Rally stalls. 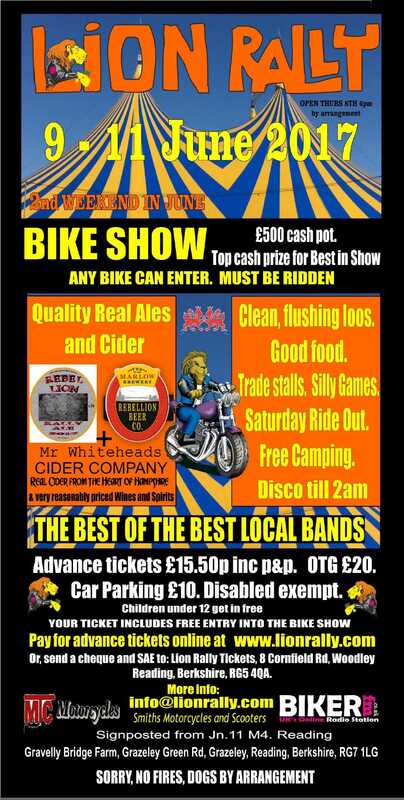 Bike show Saturday afternoon. Silly games, Bucking bronco, Bouncy castle. Camping available £5.00 per pitch. 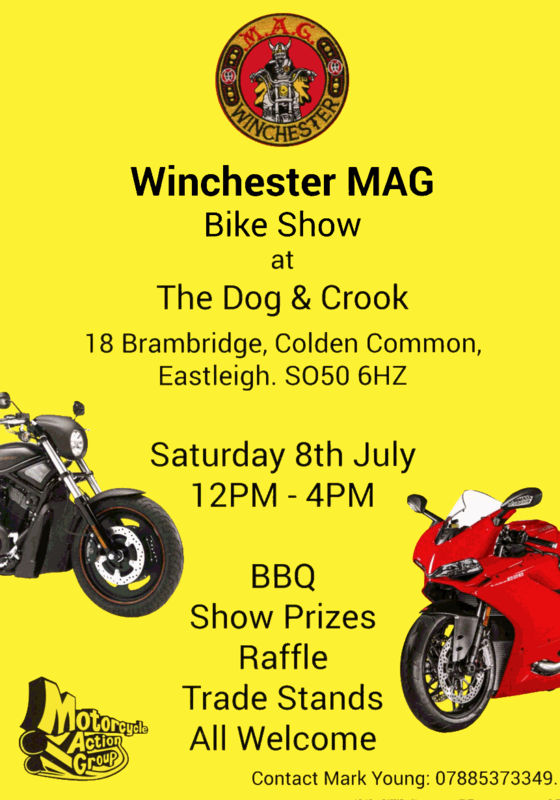 Winchester MAG 1st Birthday Barbecue Bring your own food and drinks. Party to be held at Andy's house. Call in at New Queen's Head for directions. 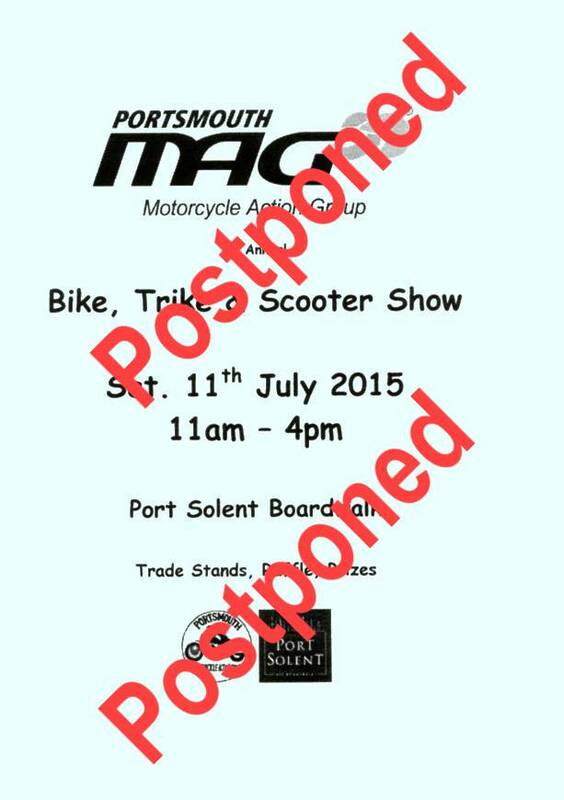 Cancelled due to event clash.